Had a fantastic experience today. Found out genders of our twins!!. Staff were professional and took really good care of us. Would recommend them to others , we look forward to a return visit for more fantastic images of our unborn twins. The heartbeat bears were a lovely touch, such a precious keepsake. Thank you so much for a lovely day. Very clear pictures.. explained everything to us in detail . Amazing staff , lovely experience for all of us! Will definitely recommend to our friends and family! Lovely large scan room. The staff are very friendly and accommodating. Amazing friendly and welcoming staff went above and beyond to make it a special experience. Baby was a bit camera shy and the staff encouraged me to go for a walk and move around even though this was their last appointment of the day at no point did we feel rushed they geniunly seemed to care about making it the best experience possible. The heart beat bears were a lovely touch that we listen to daily. Have already recommended the place to some fellow expectant mothers and would be my first choice for any future babies. Excellent customer service by all staff. The building itself has a fresh, relaxed and professional look. Scan room is tranquil and the staff are wonderful at putting you at ease! It’s easy!!! The person conducting the scan was so thorough and took her time to show you everything possible!! It’s our first baby so first time going outside usual nhs. I guarantee it’ll be the best money you’ve spent to see your wee baby and get clear pictures of them and gender reveal should you wish. The girl Gemma was very professional and helpful as were all staff. My sister is going now on my recommendation ( she’s close behind me for expecting !) as I’m a tough customer to impress but impress they did!!! Well done window to the womb. Ps really easy to find!!!! My wife had to be seen some weeks ago but unfortunately there were no available sonographers on the day. After phoning to find out what the issue was we were told that all sonographers had all fell sick and that the appointment had to be cancelled. Following a complaint they managed to bring a sonographer on call to carry out the scan. Some minutes later a sonographer named Carol came and performed the scan. She couldn´t have been more helpful and caring. She was extremely nice to her and carried a very detailed scan and spend quite a lot of time to see every single detail. In summary, they managed to succesfully turn an unpleasent situation for a customer into a very good performance!! Our Hamilton clinic is home to a firstScan early pregnancy clinic. Offering scans from 6-15 Weeks. Our Hamilton baby scan clinic is located on Bothwell Road which is just a short drive from the M74 and just 2 miles from Hamilton Central Train station. Window to the Womb in Hamilton, Glasgow specialise in providing scans all trimesters of pregnancy. from Early Pregnancy scans at 6 weeks right through to Growth & Presentation scan up to 42 weeks. All of our scans start with a Well-Being Check ; our fully qualified & registered sonographers will check baby’s movement, heartbeat, position and placental position. Each package is tailored to suit each expecting mum and their family, so whether you’d like a scan to check baby’s measurements, to see baby in a 4D scan or you want to walk away with prints, digital movies & images, heartbeat bears and more, Window To The Womb are here for every part of your pregnancy, to create memories that you, and your family, can cherish forever! Starting with our Reassurance Scans, Viability Scans & Dating Scansfrom 6-15+6 weeks. Costing only £79 and offering you a first glimpse into the life growing inside of you and the chance to calm any nerves you may have about the 1st trimester of pregnancy, with a print to take away and a full obstetric report. We offer our 99.9% accurate Well-Being & Gender Scan from 16-22 weeks for just £59,you can visit us a full 4 weeks before the NHS scans for gender. 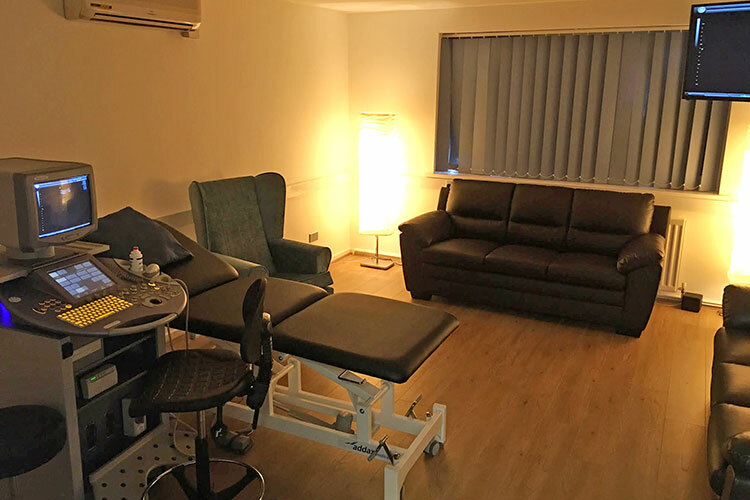 In our relaxing environment you’ll feel right at home, with relaxing music and dimmed lighting enhancing the large screens around the scan room where you can see baby in their protected world. From 24-34 weeks we offer a selection of fantastic 4D Scans from £99, giving you the ability to see babies features and have a true bonding experience with your baby, where family can come together to have a glimpse into babies world in the womb. We accommodate up to 10 guests including mum-to-be. With screens all-around the scan room so everyone can feel involved in the experience. We have also introduced our Growth & Presentation Baby Scan that’s £69 for between 26-40 weeks and includes a more detailed Well-being check that includes presentation of baby & placenta position, head and abdominal circumference measurements, femur length measurements & estimated fetal weight. Don’t forget you can also purchase gift vouchers for all of our scan packages in the clinic or online,the perfect gift for expectant mums! Our Hamilton baby scan Clinic is the leading clinic in the area to offer expectant parents the opportunity to meet baby in the very latest technology which will give you a truly amazing view into your baby’s protected world. We are delighted to be able to offer our unique ultrasound baby scanning services to mums-to-be and their families from Hamilton, Bothwell, East Kilbride,Motherwell, Bellshill, Uddingston, Carlin, Cambuslang, Holytown, Glasgow. Our Hamilton, baby scan Clinic has loads of room for you to bring friends,family and children with you to share this wonderful experience with, feel free to bring up to 10 additional guests including any small children. Jemma and her team look forward to welcoming you, your family and of course your bump to our Hamilton, Glasgow baby scan Clinic and having the privilege of introducing you all to your baby. The ladies at Window to the Womb Hamilton look forward to welcoming you into our based scan clinic. The Hamilton team thrive on providing you with the ultimate baby scan experience and it is a magical moment for us to share your experience with you. Our team are there to provide you with all the help and support you need and to answer any of your questions. The scanning equipment used by Window to the Womb Hamilton is state-of-the-art scanning equipment in the GE Voluson S8. Ultrasound technology has been researched extensively in hundreds of clinical studies over the past 30 years and has not been shown to cause any harm to either mother or baby with routine scanning now a normal procedure in all pregnancies. In 3D/4D scanning, exactly the same type and intensity of ultrasound is used as with conventional 2D scanning. 3D and 4D ultrasound both utilise sound waves to look inside the body. A probe placed on the body emits sound waves into the body, listens for the return echo and generates an image. 4D ultrasound will be similar therefore to a conventional scan in terms of exposure. This is likely the same machine that the NHS will use in your 12 week dating and 20 week anomoly scans. When choosing a baby scan clinic to book your scan with, we suggest that you request information on what equipment they have in clinic, as we believe that the specialist and fixed Voluson S8 offers a far superior quality of images than a mobile laptop and doppler, that is typically carried from one location to the next. To make sure that mum and up to 5 guests have the very best experience, Window to the Womb baby scan clinic in Hamilton features features 3x 50" screens. This means that everybody can enjoy meeting baby in his/her protected little world. Gender/Sexing Scans Anderston, Private 3D/4D Scans Anderston, Private Early Pregnancy Scans Anderston, Private Growth And Presentation Scans Anderston, 4D Scan Anderston, 3D Scan Anderston, Gender Scan Anderston, Baby Scan Anderston, Pregnancy Scan Anderston, Early Pregnancy Scan Anderston, Private Ultrasound Scan Anderston, Reassurance Scans Anderston, Early Viability Scans Anderston, Dating Scans Anderston. Private Baby Scans Anniesland, Private Baby Ultrasound Scans Anniesland, Private Pregnancy Scans Anniesland, Private Well Being And Reassurance Scans Anniesland, Private Gender/Sexing Scans Anniesland, Private 3D/4D Scans Anniesland, Private Early Pregnancy Scans Anniesland, Private Growth And Presentation Scans Anniesland, 4D Scan Anniesland, 3D Scan Anniesland, Gender Scan Anniesland, Baby Scan Anniesland, Pregnancy Scan Anniesland, Early Pregnancy Scan Anniesland, Private Ultrasound Scan Anniesland, Reassurance Scans Anniesland, Early Viability Scans Anniesland, Dating Scans Anniesland. Private Baby Scans Auchenshuggle, Private Baby Ultrasound Scans Auchenshuggle, Private Pregnancy Scans Auchenshuggle, Private Well Being And Reassurance Scans Auchenshuggle, Private Gender/Sexing Scans Auchenshuggle, Private 3D/4D Scans Auchenshuggle, Private Early Pregnancy Scans Auchenshuggle, Private Growth And Presentation Scans Auchenshuggle, 4D Scan Auchenshuggle, 3D Scan Auchenshuggle, Gender Scan Auchenshuggle, Baby Scan Auchenshuggle, Pregnancy Scan Auchenshuggle, Early Pregnancy Scan Auchenshuggle, Private Ultrasound Scan Auchenshuggle, Reassurance Scans Auchenshuggle, Early Viability Scans Auchenshuggle, Dating Scans Auchenshuggle. Private Baby Scans Baillieston, Private Baby Ultrasound Scans Baillieston, Private Pregnancy Scans Baillieston, Private Well Being And Reassurance Scans Baillieston, Private Gender/Sexing Scans Baillieston, Private 3D/4D Scans Baillieston, Private Early Pregnancy Scans Baillieston, Private Growth And Presentation Scans Baillieston, 4D Scan Baillieston, 3D Scan Baillieston, Gender Scan Baillieston, Baby Scan Baillieston, Pregnancy Scan Baillieston, Early Pregnancy Scan Baillieston, Private Ultrasound Scan Baillieston, Reassurance Scans Baillieston, Early Viability Scans Baillieston, Dating Scans Baillieston. Private Baby Scans Balornock, Private Baby Ultrasound Scans Balornock, Private Pregnancy Scans Balornock, Private Well Being And Reassurance Scans Balornock, Private Gender/Sexing Scans Balornock, Private 3D/4D Scans Balornock, Private Early Pregnancy Scans Balornock, Private Growth And Presentation Scans Balornock, 4D Scan Balornock, 3D Scan Balornock, Gender Scan Balornock, Baby Scan Balornock, Pregnancy Scan Balornock, Early Pregnancy Scan Balornock, Private Ultrasound Scan Balornock, Reassurance Scans Balornock, Early Viability Scans Balornock, Dating Scans Balornock. Private Baby Scans Barlanark, Private Baby Ultrasound Scans Barlanark, Private Pregnancy Scans Barlanark, Private Well Being And Reassurance Scans Barlanark, Private Gender/Sexing Scans Barlanark, Private 3D/4D Scans Barlanark, Private Early Pregnancy Scans Barlanark, Private Growth And Presentation Scans Barlanark, 4D Scan Barlanark, 3D Scan Barlanark, Gender Scan Barlanark, Baby Scan Barlanark, Pregnancy Scan Barlanark, Early Pregnancy Scan Barlanark, Private Ultrasound Scan Barlanark, Reassurance Scans Barlanark, Early Viability Scans Barlanark, Dating Scans Barlanark. Private Baby Scans Barmulloch, Private Baby Ultrasound Scans Barmulloch, Private Pregnancy Scans Barmulloch, Private Well Being And Reassurance Scans Barmulloch, Private Gender/Sexing Scans Barmulloch, Private 3D/4D Scans Barmulloch, Private Early Pregnancy Scans Barmulloch, Private Growth And Presentation Scans Barmulloch, 4D Scan Barmulloch, 3D Scan Barmulloch, Gender Scan Barmulloch, Baby Scan Barmulloch, Pregnancy Scan Barmulloch, Early Pregnancy Scan Barmulloch, Private Ultrasound Scan Barmulloch, Reassurance Scans Barmulloch, Early Viability Scans Barmulloch, Dating Scans Barmulloch. Private Baby Scans Barrachnie, Private Baby Ultrasound Scans Barrachnie, Private Pregnancy Scans Barrachnie, Private Well Being And Reassurance Scans Barrachnie, Private Gender/Sexing Scans Barrachnie, Private 3D/4D Scans Barrachnie, Private Early Pregnancy Scans Barrachnie, Private Growth And Presentation Scans Barrachnie, 4D Scan Barrachnie, 3D Scan Barrachnie, Gender Scan Barrachnie, Baby Scan Barrachnie, Pregnancy Scan Barrachnie, Early Pregnancy Scan Barrachnie, Private Ultrasound Scan Barrachnie, Reassurance Scans Barrachnie, Early Viability Scans Barrachnie, Dating Scans Barrachnie. Private Baby Scans Barrowfield, Private Baby Ultrasound Scans Barrowfield, Private Pregnancy Scans Barrowfield, Private Well Being And Reassurance Scans Barrowfield, Private Gender/Sexing Scans Barrowfield, Private 3D/4D Scans Barrowfield, Private Early Pregnancy Scans Barrowfield, Private Growth And Presentation Scans Barrowfield, 4D Scan Barrowfield, 3D Scan Barrowfield, Gender Scan Barrowfield, Baby Scan Barrowfield, Pregnancy Scan Barrowfield, Early Pregnancy Scan Barrowfield, Private Ultrasound Scan Barrowfield, Reassurance Scans Barrowfield, Early Viability Scans Barrowfield, Dating Scans Barrowfield. Private Baby Scans Blackhill, Private Baby Ultrasound Scans Blackhill, Private Pregnancy Scans Blackhill, Private Well Being And Reassurance Scans Blackhill, Private Gender/Sexing Scans Blackhill, Private 3D/4D Scans Blackhill, Private Early Pregnancy Scans Blackhill, Private Growth And Presentation Scans Blackhill, 4D Scan Blackhill, 3D Scan Blackhill, Gender Scan Blackhill, Baby Scan Blackhill, Pregnancy Scan Blackhill, Early Pregnancy Scan Blackhill, Private Ultrasound Scan Blackhill, Reassurance Scans Blackhill, Early Viability Scans Blackhill, Dating Scans Blackhill. Private Baby Scans Blairdardie, Private Baby Ultrasound Scans Blairdardie, Private Pregnancy Scans Blairdardie, Private Well Being And Reassurance Scans Blairdardie, Private Gender/Sexing Scans Blairdardie, Private 3D/4D Scans Blairdardie, Private Early Pregnancy Scans Blairdardie, Private Growth And Presentation Scans Blairdardie, 4D Scan Blairdardie, 3D Scan Blairdardie, Gender Scan Blairdardie, Baby Scan Blairdardie, Pregnancy Scan Blairdardie, Early Pregnancy Scan Blairdardie, Private Ultrasound Scan Blairdardie, Reassurance Scans Blairdardie, Early Viability Scans Blairdardie, Dating Scans Blairdardie. Private Baby Scans Blochairn, Private Baby Ultrasound Scans Blochairn, Private Pregnancy Scans Blochairn, Private Well Being And Reassurance Scans Blochairn, Private Gender/Sexing Scans Blochairn, Private 3D/4D Scans Blochairn, Private Early Pregnancy Scans Blochairn, Private Growth And Presentation Scans Blochairn, 4D Scan Blochairn, 3D Scan Blochairn, Gender Scan Blochairn, Baby Scan Blochairn, Pregnancy Scan Blochairn, Early Pregnancy Scan Blochairn, Private Ultrasound Scan Blochairn, Reassurance Scans Blochairn, Early Viability Scans Blochairn, Dating Scans Blochairn. Private Baby Scans Botany, Private Baby Ultrasound Scans Botany, Private Pregnancy Scans Botany, Private Well Being And Reassurance Scans Botany, Private Gender/Sexing Scans Botany, Private 3D/4D Scans Botany, Private Early Pregnancy Scans Botany, Private Growth And Presentation Scans Botany, 4D Scan Botany, 3D Scan Botany, Gender Scan Botany, Baby Scan Botany, Pregnancy Scan Botany, Early Pregnancy Scan Botany, Private Ultrasound Scan Botany, Reassurance Scans Botany, Early Viability Scans Botany, Dating Scans Botany. Private Baby Scans Braidfauld, Private Baby Ultrasound Scans Braidfauld, Private Pregnancy Scans Braidfauld, Private Well Being And Reassurance Scans Braidfauld, Private Gender/Sexing Scans Braidfauld, Private 3D/4D Scans Braidfauld, Private Early Pregnancy Scans Braidfauld, Private Growth And Presentation Scans Braidfauld, 4D Scan Braidfauld, 3D Scan Braidfauld, Gender Scan Braidfauld, Baby Scan Braidfauld, Pregnancy Scan Braidfauld, Early Pregnancy Scan Braidfauld, Private Ultrasound Scan Braidfauld, Reassurance Scans Braidfauld, Early Viability Scans Braidfauld, Dating Scans Braidfauld. Private Baby Scans Bridgeton, Private Baby Ultrasound Scans Bridgeton, Private Pregnancy Scans Bridgeton, Private Well Being And Reassurance Scans Bridgeton, Private Gender/Sexing Scans Bridgeton, Private 3D/4D Scans Bridgeton, Private Early Pregnancy Scans Bridgeton, Private Growth And Presentation Scans Bridgeton, 4D Scan Bridgeton, 3D Scan Bridgeton, Gender Scan Bridgeton, Baby Scan Bridgeton, Pregnancy Scan Bridgeton, Early Pregnancy Scan Bridgeton, Private Ultrasound Scan Bridgeton, Reassurance Scans Bridgeton, Early Viability Scans Bridgeton, Dating Scans Bridgeton. Private Baby Scans Broomhill, Private Baby Ultrasound Scans Broomhill, Private Pregnancy Scans Broomhill, Private Well Being And Reassurance Scans Broomhill, Private Gender/Sexing Scans Broomhill, Private 3D/4D Scans Broomhill, Private Early Pregnancy Scans Broomhill, Private Growth And Presentation Scans Broomhill, 4D Scan Broomhill, 3D Scan Broomhill, Gender Scan Broomhill, Baby Scan Broomhill, Pregnancy Scan Broomhill, Early Pregnancy Scan Broomhill, Private Ultrasound Scan Broomhill, Reassurance Scans Broomhill, Early Viability Scans Broomhill, Dating Scans Broomhill. Private Baby Scans Budhill, Private Baby Ultrasound Scans Budhill, Private Pregnancy Scans Budhill, Private Well Being And Reassurance Scans Budhill, Private Gender/Sexing Scans Budhill, Private 3D/4D Scans Budhill, Private Early Pregnancy Scans Budhill, Private Growth And Presentation Scans Budhill, 4D Scan Budhill, 3D Scan Budhill, Gender Scan Budhill, Baby Scan Budhill, Pregnancy Scan Budhill, Early Pregnancy Scan Budhill, Private Ultrasound Scan Budhill, Reassurance Scans Budhill, Early Viability Scans Budhill, Dating Scans Budhill. Private Baby Scans Calton, Private Baby Ultrasound Scans Calton, Private Pregnancy Scans Calton, Private Well Being And Reassurance Scans Calton, Private Gender/Sexing Scans Calton, Private 3D/4D Scans Calton, Private Early Pregnancy Scans Calton, Private Growth And Presentation Scans Calton, 4D Scan Calton, 3D Scan Calton, Gender Scan Calton, Baby Scan Calton, Pregnancy Scan Calton, Early Pregnancy Scan Calton, Private Ultrasound Scan Calton, Reassurance Scans Calton, Early Viability Scans Calton, Dating Scans Calton. Private Baby Scans Camlachie, Private Baby Ultrasound Scans Camlachie, Private Pregnancy Scans Camlachie, Private Well Being And Reassurance Scans Camlachie, Private Gender/Sexing Scans Camlachie, Private 3D/4D Scans Camlachie, Private Early Pregnancy Scans Camlachie, Private Growth And Presentation Scans Camlachie, 4D Scan Camlachie, 3D Scan Camlachie, Gender Scan Camlachie, Baby Scan Camlachie, Pregnancy Scan Camlachie, Early Pregnancy Scan Camlachie, Private Ultrasound Scan Camlachie, Reassurance Scans Camlachie, Early Viability Scans Camlachie, Dating Scans Camlachie. Private Baby Scans Carmyle, Private Baby Ultrasound Scans Carmyle, Private Pregnancy Scans Carmyle, Private Well Being And Reassurance Scans Carmyle, Private Gender/Sexing Scans Carmyle, Private 3D/4D Scans Carmyle, Private Early Pregnancy Scans Carmyle, Private Growth And Presentation Scans Carmyle, 4D Scan Carmyle, 3D Scan Carmyle, Gender Scan Carmyle, Baby Scan Carmyle, Pregnancy Scan Carmyle, Early Pregnancy Scan Carmyle, Private Ultrasound Scan Carmyle, Reassurance Scans Carmyle, Early Viability Scans Carmyle, Dating Scans Carmyle. Private Baby Scans Carntyne, Private Baby Ultrasound Scans Carntyne, Private Pregnancy Scans Carntyne, Private Well Being And Reassurance Scans Carntyne, Private Gender/Sexing Scans Carntyne, Private 3D/4D Scans Carntyne, Private Early Pregnancy Scans Carntyne, Private Growth And Presentation Scans Carntyne, 4D Scan Carntyne, 3D Scan Carntyne, Gender Scan Carntyne, Baby Scan Carntyne, Pregnancy Scan Carntyne, Early Pregnancy Scan Carntyne, Private Ultrasound Scan Carntyne, Reassurance Scans Carntyne, Early Viability Scans Carntyne, Dating Scans Carntyne. Private Baby Scans Colston, Private Baby Ultrasound Scans Colston, Private Pregnancy Scans Colston, Private Well Being And Reassurance Scans Colston, Private Gender/Sexing Scans Colston, Private 3D/4D Scans Colston, Private Early Pregnancy Scans Colston, Private Growth And Presentation Scans Colston, 4D Scan Colston, 3D Scan Colston, Gender Scan Colston, Baby Scan Colston, Pregnancy Scan Colston, Early Pregnancy Scan Colston, Private Ultrasound Scan Colston, Reassurance Scans Colston, Early Viability Scans Colston, Dating Scans Colston. Private Baby Scans Cowcaddens, Private Baby Ultrasound Scans Cowcaddens, Private Pregnancy Scans Cowcaddens, Private Well Being And Reassurance Scans Cowcaddens, Private Gender/Sexing Scans Cowcaddens, Private 3D/4D Scans Cowcaddens, Private Early Pregnancy Scans Cowcaddens, Private Growth And Presentation Scans Cowcaddens, 4D Scan Cowcaddens, 3D Scan Cowcaddens, Gender Scan Cowcaddens, Baby Scan Cowcaddens, Pregnancy Scan Cowcaddens, Early Pregnancy Scan Cowcaddens, Private Ultrasound Scan Cowcaddens, Reassurance Scans Cowcaddens, Early Viability Scans Cowcaddens, Dating Scans Cowcaddens. Private Baby Scans Cowlairs, Private Baby Ultrasound Scans Cowlairs, Private Pregnancy Scans Cowlairs, Private Well Being And Reassurance Scans Cowlairs, Private Gender/Sexing Scans Cowlairs, Private 3D/4D Scans Cowlairs, Private Early Pregnancy Scans Cowlairs, Private Growth And Presentation Scans Cowlairs, 4D Scan Cowlairs, 3D Scan Cowlairs, Gender Scan Cowlairs, Baby Scan Cowlairs, Pregnancy Scan Cowlairs, Early Pregnancy Scan Cowlairs, Private Ultrasound Scan Cowlairs, Reassurance Scans Cowlairs, Early Viability Scans Cowlairs, Dating Scans Cowlairs. Private Baby Scans Craigend, Private Baby Ultrasound Scans Craigend, Private Pregnancy Scans Craigend, Private Well Being And Reassurance Scans Craigend, Private Gender/Sexing Scans Craigend, Private 3D/4D Scans Craigend, Private Early Pregnancy Scans Craigend, Private Growth And Presentation Scans Craigend, 4D Scan Craigend, 3D Scan Craigend, Gender Scan Craigend, Baby Scan Craigend, Pregnancy Scan Craigend, Early Pregnancy Scan Craigend, Private Ultrasound Scan Craigend, Reassurance Scans Craigend, Early Viability Scans Craigend, Dating Scans Craigend. Private Baby Scans Cranhill, Private Baby Ultrasound Scans Cranhill, Private Pregnancy Scans Cranhill, Private Well Being And Reassurance Scans Cranhill, Private Gender/Sexing Scans Cranhill, Private 3D/4D Scans Cranhill, Private Early Pregnancy Scans Cranhill, Private Growth And Presentation Scans Cranhill, 4D Scan Cranhill, 3D Scan Cranhill, Gender Scan Cranhill, Baby Scan Cranhill, Pregnancy Scan Cranhill, Early Pregnancy Scan Cranhill, Private Ultrasound Scan Cranhill, Reassurance Scans Cranhill, Early Viability Scans Cranhill, Dating Scans Cranhill. Private Baby Scans Dalmarnock, Private Baby Ultrasound Scans Dalmarnock, Private Pregnancy Scans Dalmarnock, Private Well Being And Reassurance Scans Dalmarnock, Private Gender/Sexing Scans Dalmarnock, Private 3D/4D Scans Dalmarnock, Private Early Pregnancy Scans Dalmarnock, Private Growth And Presentation Scans Dalmarnock, 4D Scan Dalmarnock, 3D Scan Dalmarnock, Gender Scan Dalmarnock, Baby Scan Dalmarnock, Pregnancy Scan Dalmarnock, Early Pregnancy Scan Dalmarnock, Private Ultrasound Scan Dalmarnock, Reassurance Scans Dalmarnock, Early Viability Scans Dalmarnock, Dating Scans Dalmarnock. Private Baby Scans Dennistoun, Private Baby Ultrasound Scans Dennistoun, Private Pregnancy Scans Dennistoun, Private Well Being And Reassurance Scans Dennistoun, Private Gender/Sexing Scans Dennistoun, Private 3D/4D Scans Dennistoun, Private Early Pregnancy Scans Dennistoun, Private Growth And Presentation Scans Dennistoun, 4D Scan Dennistoun, 3D Scan Dennistoun, Gender Scan Dennistoun, Baby Scan Dennistoun, Pregnancy Scan Dennistoun, Early Pregnancy Scan Dennistoun, Private Ultrasound Scan Dennistoun, Reassurance Scans Dennistoun, Early Viability Scans Dennistoun, Dating Scans Dennistoun. Private Baby Scans Dowanhill, Private Baby Ultrasound Scans Dowanhill, Private Pregnancy Scans Dowanhill, Private Well Being And Reassurance Scans Dowanhill, Private Gender/Sexing Scans Dowanhill, Private 3D/4D Scans Dowanhill, Private Early Pregnancy Scans Dowanhill, Private Growth And Presentation Scans Dowanhill, 4D Scan Dowanhill, 3D Scan Dowanhill, Gender Scan Dowanhill, Baby Scan Dowanhill, Pregnancy Scan Dowanhill, Early Pregnancy Scan Dowanhill, Private Ultrasound Scan Dowanhill, Reassurance Scans Dowanhill, Early Viability Scans Dowanhill, Dating Scans Dowanhill. Private Baby Scans Drumchapel, Private Baby Ultrasound Scans Drumchapel, Private Pregnancy Scans Drumchapel, Private Well Being And Reassurance Scans Drumchapel, Private Gender/Sexing Scans Drumchapel, Private 3D/4D Scans Drumchapel, Private Early Pregnancy Scans Drumchapel, Private Growth And Presentation Scans Drumchapel, 4D Scan Drumchapel, 3D Scan Drumchapel, Gender Scan Drumchapel, Baby Scan Drumchapel, Pregnancy Scan Drumchapel, Early Pregnancy Scan Drumchapel, Private Ultrasound Scan Drumchapel, Reassurance Scans Drumchapel, Early Viability Scans Drumchapel, Dating Scans Drumchapel. Private Baby Scans Easterhouse, Private Baby Ultrasound Scans Easterhouse, Private Pregnancy Scans Easterhouse, Private Well Being And Reassurance Scans Easterhouse, Private Gender/Sexing Scans Easterhouse, Private 3D/4D Scans Easterhouse, Private Early Pregnancy Scans Easterhouse, Private Growth And Presentation Scans Easterhouse, 4D Scan Easterhouse, 3D Scan Easterhouse, Gender Scan Easterhouse, Baby Scan Easterhouse, Pregnancy Scan Easterhouse, Early Pregnancy Scan Easterhouse, Private Ultrasound Scan Easterhouse, Reassurance Scans Easterhouse, Early Viability Scans Easterhouse, Dating Scans Easterhouse. Private Baby Scans Firhill, Private Baby Ultrasound Scans Firhill, Private Pregnancy Scans Firhill, Private Well Being And Reassurance Scans Firhill, Private Gender/Sexing Scans Firhill, Private 3D/4D Scans Firhill, Private Early Pregnancy Scans Firhill, Private Growth And Presentation Scans Firhill, 4D Scan Firhill, 3D Scan Firhill, Gender Scan Firhill, Baby Scan Firhill, Pregnancy Scan Firhill, Early Pregnancy Scan Firhill, Private Ultrasound Scan Firhill, Reassurance Scans Firhill, Early Viability Scans Firhill, Dating Scans Firhill. Private Baby Scans Garnethill, Private Baby Ultrasound Scans Garnethill, Private Pregnancy Scans Garnethill, Private Well Being And Reassurance Scans Garnethill, Private Gender/Sexing Scans Garnethill, Private 3D/4D Scans Garnethill, Private Early Pregnancy Scans Garnethill, Private Growth And Presentation Scans Garnethill, 4D Scan Garnethill, 3D Scan Garnethill, Gender Scan Garnethill, Baby Scan Garnethill, Pregnancy Scan Garnethill, Early Pregnancy Scan Garnethill, Private Ultrasound Scan Garnethill, Reassurance Scans Garnethill, Early Viability Scans Garnethill, Dating Scans Garnethill. Private Baby Scans Garrowhill, Private Baby Ultrasound Scans Garrowhill, Private Pregnancy Scans Garrowhill, Private Well Being And Reassurance Scans Garrowhill, Private Gender/Sexing Scans Garrowhill, Private 3D/4D Scans Garrowhill, Private Early Pregnancy Scans Garrowhill, Private Growth And Presentation Scans Garrowhill, 4D Scan Garrowhill, 3D Scan Garrowhill, Gender Scan Garrowhill, Baby Scan Garrowhill, Pregnancy Scan Garrowhill, Early Pregnancy Scan Garrowhill, Private Ultrasound Scan Garrowhill, Reassurance Scans Garrowhill, Early Viability Scans Garrowhill, Dating Scans Garrowhill. Private Baby Scans Garscadden, Private Baby Ultrasound Scans Garscadden, Private Pregnancy Scans Garscadden, Private Well Being And Reassurance Scans Garscadden, Private Gender/Sexing Scans Garscadden, Private 3D/4D Scans Garscadden, Private Early Pregnancy Scans Garscadden, Private Growth And Presentation Scans Garscadden, 4D Scan Garscadden, 3D Scan Garscadden, Gender Scan Garscadden, Baby Scan Garscadden, Pregnancy Scan Garscadden, Early Pregnancy Scan Garscadden, Private Ultrasound Scan Garscadden, Reassurance Scans Garscadden, Early Viability Scans Garscadden, Dating Scans Garscadden. Private Baby Scans Garthamlock, Private Baby Ultrasound Scans Garthamlock, Private Pregnancy Scans Garthamlock, Private Well Being And Reassurance Scans Garthamlock, Private Gender/Sexing Scans Garthamlock, Private 3D/4D Scans Garthamlock, Private Early Pregnancy Scans Garthamlock, Private Growth And Presentation Scans Garthamlock, 4D Scan Garthamlock, 3D Scan Garthamlock, Gender Scan Garthamlock, Baby Scan Garthamlock, Pregnancy Scan Garthamlock, Early Pregnancy Scan Garthamlock, Private Ultrasound Scan Garthamlock, Reassurance Scans Garthamlock, Early Viability Scans Garthamlock, Dating Scans Garthamlock. Private Baby Scans Germiston, Private Baby Ultrasound Scans Germiston, Private Pregnancy Scans Germiston, Private Well Being And Reassurance Scans Germiston, Private Gender/Sexing Scans Germiston, Private 3D/4D Scans Germiston, Private Early Pregnancy Scans Germiston, Private Growth And Presentation Scans Germiston, 4D Scan Germiston, 3D Scan Germiston, Gender Scan Germiston, Baby Scan Germiston, Pregnancy Scan Germiston, Early Pregnancy Scan Germiston, Private Ultrasound Scan Germiston, Reassurance Scans Germiston, Early Viability Scans Germiston, Dating Scans Germiston. Private Baby Scans Gilshochill, Private Baby Ultrasound Scans Gilshochill, Private Pregnancy Scans Gilshochill, Private Well Being And Reassurance Scans Gilshochill, Private Gender/Sexing Scans Gilshochill, Private 3D/4D Scans Gilshochill, Private Early Pregnancy Scans Gilshochill, Private Growth And Presentation Scans Gilshochill, 4D Scan Gilshochill, 3D Scan Gilshochill, Gender Scan Gilshochill, Baby Scan Gilshochill, Pregnancy Scan Gilshochill, Early Pregnancy Scan Gilshochill, Private Ultrasound Scan Gilshochill, Reassurance Scans Gilshochill, Early Viability Scans Gilshochill, Dating Scans Gilshochill. Private Baby Scans Greenfield, Private Baby Ultrasound Scans Greenfield, Private Pregnancy Scans Greenfield, Private Well Being And Reassurance Scans Greenfield, Private Gender/Sexing Scans Greenfield, Private 3D/4D Scans Greenfield, Private Early Pregnancy Scans Greenfield, Private Growth And Presentation Scans Greenfield, 4D Scan Greenfield, 3D Scan Greenfield, Gender Scan Greenfield, Baby Scan Greenfield, Pregnancy Scan Greenfield, Early Pregnancy Scan Greenfield, Private Ultrasound Scan Greenfield, Reassurance Scans Greenfield, Early Viability Scans Greenfield, Dating Scans Greenfield. Private Baby Scans Haghill, Private Baby Ultrasound Scans Haghill, Private Pregnancy Scans Haghill, Private Well Being And Reassurance Scans Haghill, Private Gender/Sexing Scans Haghill, Private 3D/4D Scans Haghill, Private Early Pregnancy Scans Haghill, Private Growth And Presentation Scans Haghill, 4D Scan Haghill, 3D Scan Haghill, Gender Scan Haghill, Baby Scan Haghill, Pregnancy Scan Haghill, Early Pregnancy Scan Haghill, Private Ultrasound Scan Haghill, Reassurance Scans Haghill, Early Viability Scans Haghill, Dating Scans Haghill. Private Baby Scans Hamiltonhill, Private Baby Ultrasound Scans Hamiltonhill, Private Pregnancy Scans Hamiltonhill, Private Well Being And Reassurance Scans Hamiltonhill, Private Gender/Sexing Scans Hamiltonhill, Private 3D/4D Scans Hamiltonhill, Private Early Pregnancy Scans Hamiltonhill, Private Growth And Presentation Scans Hamiltonhill, 4D Scan Hamiltonhill, 3D Scan Hamiltonhill, Gender Scan Hamiltonhill, Baby Scan Hamiltonhill, Pregnancy Scan Hamiltonhill, Early Pregnancy Scan Hamiltonhill, Private Ultrasound Scan Hamiltonhill, Reassurance Scans Hamiltonhill, Early Viability Scans Hamiltonhill, Dating Scans Hamiltonhill. Private Baby Scans High Possil, Private Baby Ultrasound Scans High Possil, Private Pregnancy Scans High Possil, Private Well Being And Reassurance Scans High Possil, Private Gender/Sexing Scans High Possil, Private 3D/4D Scans High Possil, Private Early Pregnancy Scans High Possil, Private Growth And Presentation Scans High Possil, 4D Scan High Possil, 3D Scan High Possil, Gender Scan High Possil, Baby Scan High Possil, Pregnancy Scan High Possil, Early Pregnancy Scan High Possil, Private Ultrasound Scan High Possil, Reassurance Scans High Possil, Early Viability Scans High Possil, Dating Scans High Possil. Private Baby Scans High Ruchill, Private Baby Ultrasound Scans High Ruchill, Private Pregnancy Scans High Ruchill, Private Well Being And Reassurance Scans High Ruchill, Private Gender/Sexing Scans High Ruchill, Private 3D/4D Scans High Ruchill, Private Early Pregnancy Scans High Ruchill, Private Growth And Presentation Scans High Ruchill, 4D Scan High Ruchill, 3D Scan High Ruchill, Gender Scan High Ruchill, Baby Scan High Ruchill, Pregnancy Scan High Ruchill, Early Pregnancy Scan High Ruchill, Private Ultrasound Scan High Ruchill, Reassurance Scans High Ruchill, Early Viability Scans High Ruchill, Dating Scans High Ruchill. Private Baby Scans Hillhead, Private Baby Ultrasound Scans Hillhead, Private Pregnancy Scans Hillhead, Private Well Being And Reassurance Scans Hillhead, Private Gender/Sexing Scans Hillhead, Private 3D/4D Scans Hillhead, Private Early Pregnancy Scans Hillhead, Private Growth And Presentation Scans Hillhead, 4D Scan Hillhead, 3D Scan Hillhead, Gender Scan Hillhead, Baby Scan Hillhead, Pregnancy Scan Hillhead, Early Pregnancy Scan Hillhead, Private Ultrasound Scan Hillhead, Reassurance Scans Hillhead, Early Viability Scans Hillhead, Dating Scans Hillhead. Private Baby Scans Hogganfield, Private Baby Ultrasound Scans Hogganfield, Private Pregnancy Scans Hogganfield, Private Well Being And Reassurance Scans Hogganfield, Private Gender/Sexing Scans Hogganfield, Private 3D/4D Scans Hogganfield, Private Early Pregnancy Scans Hogganfield, Private Growth And Presentation Scans Hogganfield, 4D Scan Hogganfield, 3D Scan Hogganfield, Gender Scan Hogganfield, Baby Scan Hogganfield, Pregnancy Scan Hogganfield, Early Pregnancy Scan Hogganfield, Private Ultrasound Scan Hogganfield, Reassurance Scans Hogganfield, Early Viability Scans Hogganfield, Dating Scans Hogganfield. Private Baby Scans Hyndland, Private Baby Ultrasound Scans Hyndland, Private Pregnancy Scans Hyndland, Private Well Being And Reassurance Scans Hyndland, Private Gender/Sexing Scans Hyndland, Private 3D/4D Scans Hyndland, Private Early Pregnancy Scans Hyndland, Private Growth And Presentation Scans Hyndland, 4D Scan Hyndland, 3D Scan Hyndland, Gender Scan Hyndland, Baby Scan Hyndland, Pregnancy Scan Hyndland, Early Pregnancy Scan Hyndland, Private Ultrasound Scan Hyndland, Reassurance Scans Hyndland, Early Viability Scans Hyndland, Dating Scans Hyndland. Private Baby Scans Jordanhill, Private Baby Ultrasound Scans Jordanhill, Private Pregnancy Scans Jordanhill, Private Well Being And Reassurance Scans Jordanhill, Private Gender/Sexing Scans Jordanhill, Private 3D/4D Scans Jordanhill, Private Early Pregnancy Scans Jordanhill, Private Growth And Presentation Scans Jordanhill, 4D Scan Jordanhill, 3D Scan Jordanhill, Gender Scan Jordanhill, Baby Scan Jordanhill, Pregnancy Scan Jordanhill, Early Pregnancy Scan Jordanhill, Private Ultrasound Scan Jordanhill, Reassurance Scans Jordanhill, Early Viability Scans Jordanhill, Dating Scans Jordanhill. Private Baby Scans Kelvindale, Private Baby Ultrasound Scans Kelvindale, Private Pregnancy Scans Kelvindale, Private Well Being And Reassurance Scans Kelvindale, Private Gender/Sexing Scans Kelvindale, Private 3D/4D Scans Kelvindale, Private Early Pregnancy Scans Kelvindale, Private Growth And Presentation Scans Kelvindale, 4D Scan Kelvindale, 3D Scan Kelvindale, Gender Scan Kelvindale, Baby Scan Kelvindale, Pregnancy Scan Kelvindale, Early Pregnancy Scan Kelvindale, Private Ultrasound Scan Kelvindale, Reassurance Scans Kelvindale, Early Viability Scans Kelvindale, Dating Scans Kelvindale. Private Baby Scans Kelvinside, Private Baby Ultrasound Scans Kelvinside, Private Pregnancy Scans Kelvinside, Private Well Being And Reassurance Scans Kelvinside, Private Gender/Sexing Scans Kelvinside, Private 3D/4D Scans Kelvinside, Private Early Pregnancy Scans Kelvinside, Private Growth And Presentation Scans Kelvinside, 4D Scan Kelvinside, 3D Scan Kelvinside, Gender Scan Kelvinside, Baby Scan Kelvinside, Pregnancy Scan Kelvinside, Early Pregnancy Scan Kelvinside, Private Ultrasound Scan Kelvinside, Reassurance Scans Kelvinside, Early Viability Scans Kelvinside, Dating Scans Kelvinside. Private Baby Scans Knightswood, Private Baby Ultrasound Scans Knightswood, Private Pregnancy Scans Knightswood, Private Well Being And Reassurance Scans Knightswood, Private Gender/Sexing Scans Knightswood, Private 3D/4D Scans Knightswood, Private Early Pregnancy Scans Knightswood, Private Growth And Presentation Scans Knightswood, 4D Scan Knightswood, 3D Scan Knightswood, Gender Scan Knightswood, Baby Scan Knightswood, Pregnancy Scan Knightswood, Early Pregnancy Scan Knightswood, Private Ultrasound Scan Knightswood, Reassurance Scans Knightswood, Early Viability Scans Knightswood, Dating Scans Knightswood. Private Baby Scans Lambhill, Private Baby Ultrasound Scans Lambhill, Private Pregnancy Scans Lambhill, Private Well Being And Reassurance Scans Lambhill, Private Gender/Sexing Scans Lambhill, Private 3D/4D Scans Lambhill, Private Early Pregnancy Scans Lambhill, Private Growth And Presentation Scans Lambhill, 4D Scan Lambhill, 3D Scan Lambhill, Gender Scan Lambhill, Baby Scan Lambhill, Pregnancy Scan Lambhill, Early Pregnancy Scan Lambhill, Private Ultrasound Scan Lambhill, Reassurance Scans Lambhill, Early Viability Scans Lambhill, Dating Scans Lambhill. Private Baby Scans Lightburn, Private Baby Ultrasound Scans Lightburn, Private Pregnancy Scans Lightburn, Private Well Being And Reassurance Scans Lightburn, Private Gender/Sexing Scans Lightburn, Private 3D/4D Scans Lightburn, Private Early Pregnancy Scans Lightburn, Private Growth And Presentation Scans Lightburn, 4D Scan Lightburn, 3D Scan Lightburn, Gender Scan Lightburn, Baby Scan Lightburn, Pregnancy Scan Lightburn, Early Pregnancy Scan Lightburn, Private Ultrasound Scan Lightburn, Reassurance Scans Lightburn, Early Viability Scans Lightburn, Dating Scans Lightburn. Private Baby Scans Lilybank, Private Baby Ultrasound Scans Lilybank, Private Pregnancy Scans Lilybank, Private Well Being And Reassurance Scans Lilybank, Private Gender/Sexing Scans Lilybank, Private 3D/4D Scans Lilybank, Private Early Pregnancy Scans Lilybank, Private Growth And Presentation Scans Lilybank, 4D Scan Lilybank, 3D Scan Lilybank, Gender Scan Lilybank, Baby Scan Lilybank, Pregnancy Scan Lilybank, Early Pregnancy Scan Lilybank, Private Ultrasound Scan Lilybank, Reassurance Scans Lilybank, Early Viability Scans Lilybank, Dating Scans Lilybank. Private Baby Scans Maryhill, Private Baby Ultrasound Scans Maryhill, Private Pregnancy Scans Maryhill, Private Well Being And Reassurance Scans Maryhill, Private Gender/Sexing Scans Maryhill, Private 3D/4D Scans Maryhill, Private Early Pregnancy Scans Maryhill, Private Growth And Presentation Scans Maryhill, 4D Scan Maryhill, 3D Scan Maryhill, Gender Scan Maryhill, Baby Scan Maryhill, Pregnancy Scan Maryhill, Early Pregnancy Scan Maryhill, Private Ultrasound Scan Maryhill, Reassurance Scans Maryhill, Early Viability Scans Maryhill, Dating Scans Maryhill. Private Baby Scans Maryhill Park, Private Baby Ultrasound Scans Maryhill Park, Private Pregnancy Scans Maryhill Park, Private Well Being And Reassurance Scans Maryhill Park, Private Gender/Sexing Scans Maryhill Park, Private 3D/4D Scans Maryhill Park, Private Early Pregnancy Scans Maryhill Park, Private Growth And Presentation Scans Maryhill Park, 4D Scan Maryhill Park, 3D Scan Maryhill Park, Gender Scan Maryhill Park, Baby Scan Maryhill Park, Pregnancy Scan Maryhill Park, Early Pregnancy Scan Maryhill Park, Private Ultrasound Scan Maryhill Park, Reassurance Scans Maryhill Park, Early Viability Scans Maryhill Park, Dating Scans Maryhill Park. Private Baby Scans Millerston, Private Baby Ultrasound Scans Millerston, Private Pregnancy Scans Millerston, Private Well Being And Reassurance Scans Millerston, Private Gender/Sexing Scans Millerston, Private 3D/4D Scans Millerston, Private Early Pregnancy Scans Millerston, Private Growth And Presentation Scans Millerston, 4D Scan Millerston, 3D Scan Millerston, Gender Scan Millerston, Baby Scan Millerston, Pregnancy Scan Millerston, Early Pregnancy Scan Millerston, Private Ultrasound Scan Millerston, Reassurance Scans Millerston, Early Viability Scans Millerston, Dating Scans Millerston. Private Baby Scans Milton, Private Baby Ultrasound Scans Milton, Private Pregnancy Scans Milton, Private Well Being And Reassurance Scans Milton, Private Gender/Sexing Scans Milton, Private 3D/4D Scans Milton, Private Early Pregnancy Scans Milton, Private Growth And Presentation Scans Milton, 4D Scan Milton, 3D Scan Milton, Gender Scan Milton, Baby Scan Milton, Pregnancy Scan Milton, Early Pregnancy Scan Milton, Private Ultrasound Scan Milton, Reassurance Scans Milton, Early Viability Scans Milton, Dating Scans Milton. Private Baby Scans Mount Vernon, Private Baby Ultrasound Scans Mount Vernon, Private Pregnancy Scans Mount Vernon, Private Well Being And Reassurance Scans Mount Vernon, Private Gender/Sexing Scans Mount Vernon, Private 3D/4D Scans Mount Vernon, Private Early Pregnancy Scans Mount Vernon, Private Growth And Presentation Scans Mount Vernon, 4D Scan Mount Vernon, 3D Scan Mount Vernon, Gender Scan Mount Vernon, Baby Scan Mount Vernon, Pregnancy Scan Mount Vernon, Early Pregnancy Scan Mount Vernon, Private Ultrasound Scan Mount Vernon, Reassurance Scans Mount Vernon, Early Viability Scans Mount Vernon, Dating Scans Mount Vernon. Private Baby Scans Netherton, Private Baby Ultrasound Scans Netherton, Private Pregnancy Scans Netherton, Private Well Being And Reassurance Scans Netherton, Private Gender/Sexing Scans Netherton, Private 3D/4D Scans Netherton, Private Early Pregnancy Scans Netherton, Private Growth And Presentation Scans Netherton, 4D Scan Netherton, 3D Scan Netherton, Gender Scan Netherton, Baby Scan Netherton, Pregnancy Scan Netherton, Early Pregnancy Scan Netherton, Private Ultrasound Scan Netherton, Reassurance Scans Netherton, Early Viability Scans Netherton, Dating Scans Netherton. Private Baby Scans Newbank, Private Baby Ultrasound Scans Newbank, Private Pregnancy Scans Newbank, Private Well Being And Reassurance Scans Newbank, Private Gender/Sexing Scans Newbank, Private 3D/4D Scans Newbank, Private Early Pregnancy Scans Newbank, Private Growth And Presentation Scans Newbank, 4D Scan Newbank, 3D Scan Newbank, Gender Scan Newbank, Baby Scan Newbank, Pregnancy Scan Newbank, Early Pregnancy Scan Newbank, Private Ultrasound Scan Newbank, Reassurance Scans Newbank, Early Viability Scans Newbank, Dating Scans Newbank. Private Baby Scans North Kelvinside, Private Baby Ultrasound Scans North Kelvinside, Private Pregnancy Scans North Kelvinside, Private Well Being And Reassurance Scans North Kelvinside, Private Gender/Sexing Scans North Kelvinside, Private 3D/4D Scans North Kelvinside, Private Early Pregnancy Scans North Kelvinside, Private Growth And Presentation Scans North Kelvinside, 4D Scan North Kelvinside, 3D Scan North Kelvinside, Gender Scan North Kelvinside, Baby Scan North Kelvinside, Pregnancy Scan North Kelvinside, Early Pregnancy Scan North Kelvinside, Private Ultrasound Scan North Kelvinside, Reassurance Scans North Kelvinside, Early Viability Scans North Kelvinside, Dating Scans North Kelvinside. Private Baby Scans Park District, Private Baby Ultrasound Scans Park District, Private Pregnancy Scans Park District, Private Well Being And Reassurance Scans Park District, Private Gender/Sexing Scans Park District, Private 3D/4D Scans Park District, Private Early Pregnancy Scans Park District, Private Growth And Presentation Scans Park District, 4D Scan Park District, 3D Scan Park District, Gender Scan Park District, Baby Scan Park District, Pregnancy Scan Park District, Early Pregnancy Scan Park District, Private Ultrasound Scan Park District, Reassurance Scans Park District, Early Viability Scans Park District, Dating Scans Park District. Private Baby Scans Parkhead, Private Baby Ultrasound Scans Parkhead, Private Pregnancy Scans Parkhead, Private Well Being And Reassurance Scans Parkhead, Private Gender/Sexing Scans Parkhead, Private 3D/4D Scans Parkhead, Private Early Pregnancy Scans Parkhead, Private Growth And Presentation Scans Parkhead, 4D Scan Parkhead, 3D Scan Parkhead, Gender Scan Parkhead, Baby Scan Parkhead, Pregnancy Scan Parkhead, Early Pregnancy Scan Parkhead, Private Ultrasound Scan Parkhead, Reassurance Scans Parkhead, Early Viability Scans Parkhead, Dating Scans Parkhead. Private Baby Scans Partick, Private Baby Ultrasound Scans Partick, Private Pregnancy Scans Partick, Private Well Being And Reassurance Scans Partick, Private Gender/Sexing Scans Partick, Private 3D/4D Scans Partick, Private Early Pregnancy Scans Partick, Private Growth And Presentation Scans Partick, 4D Scan Partick, 3D Scan Partick, Gender Scan Partick, Baby Scan Partick, Pregnancy Scan Partick, Early Pregnancy Scan Partick, Private Ultrasound Scan Partick, Reassurance Scans Partick, Early Viability Scans Partick, Dating Scans Partick. Private Baby Scans Partickhill, Private Baby Ultrasound Scans Partickhill, Private Pregnancy Scans Partickhill, Private Well Being And Reassurance Scans Partickhill, Private Gender/Sexing Scans Partickhill, Private 3D/4D Scans Partickhill, Private Early Pregnancy Scans Partickhill, Private Growth And Presentation Scans Partickhill, 4D Scan Partickhill, 3D Scan Partickhill, Gender Scan Partickhill, Baby Scan Partickhill, Pregnancy Scan Partickhill, Early Pregnancy Scan Partickhill, Private Ultrasound Scan Partickhill, Reassurance Scans Partickhill, Early Viability Scans Partickhill, Dating Scans Partickhill. Private Baby Scans Possilpark, Private Baby Ultrasound Scans Possilpark, Private Pregnancy Scans Possilpark, Private Well Being And Reassurance Scans Possilpark, Private Gender/Sexing Scans Possilpark, Private 3D/4D Scans Possilpark, Private Early Pregnancy Scans Possilpark, Private Growth And Presentation Scans Possilpark, 4D Scan Possilpark, 3D Scan Possilpark, Gender Scan Possilpark, Baby Scan Possilpark, Pregnancy Scan Possilpark, Early Pregnancy Scan Possilpark, Private Ultrasound Scan Possilpark, Reassurance Scans Possilpark, Early Viability Scans Possilpark, Dating Scans Possilpark. Private Baby Scans Provanhall, Private Baby Ultrasound Scans Provanhall, Private Pregnancy Scans Provanhall, Private Well Being And Reassurance Scans Provanhall, Private Gender/Sexing Scans Provanhall, Private 3D/4D Scans Provanhall, Private Early Pregnancy Scans Provanhall, Private Growth And Presentation Scans Provanhall, 4D Scan Provanhall, 3D Scan Provanhall, Gender Scan Provanhall, Baby Scan Provanhall, Pregnancy Scan Provanhall, Early Pregnancy Scan Provanhall, Private Ultrasound Scan Provanhall, Reassurance Scans Provanhall, Early Viability Scans Provanhall, Dating Scans Provanhall. Private Baby Scans Provanmill, Private Baby Ultrasound Scans Provanmill, Private Pregnancy Scans Provanmill, Private Well Being And Reassurance Scans Provanmill, Private Gender/Sexing Scans Provanmill, Private 3D/4D Scans Provanmill, Private Early Pregnancy Scans Provanmill, Private Growth And Presentation Scans Provanmill, 4D Scan Provanmill, 3D Scan Provanmill, Gender Scan Provanmill, Baby Scan Provanmill, Pregnancy Scan Provanmill, Early Pregnancy Scan Provanmill, Private Ultrasound Scan Provanmill, Reassurance Scans Provanmill, Early Viability Scans Provanmill, Dating Scans Provanmill. Private Baby Scans Queenslie, Private Baby Ultrasound Scans Queenslie, Private Pregnancy Scans Queenslie, Private Well Being And Reassurance Scans Queenslie, Private Gender/Sexing Scans Queenslie, Private 3D/4D Scans Queenslie, Private Early Pregnancy Scans Queenslie, Private Growth And Presentation Scans Queenslie, 4D Scan Queenslie, 3D Scan Queenslie, Gender Scan Queenslie, Baby Scan Queenslie, Pregnancy Scan Queenslie, Early Pregnancy Scan Queenslie, Private Ultrasound Scan Queenslie, Reassurance Scans Queenslie, Early Viability Scans Queenslie, Dating Scans Queenslie. Private Baby Scans Riddrie, Private Baby Ultrasound Scans Riddrie, Private Pregnancy Scans Riddrie, Private Well Being And Reassurance Scans Riddrie, Private Gender/Sexing Scans Riddrie, Private 3D/4D Scans Riddrie, Private Early Pregnancy Scans Riddrie, Private Growth And Presentation Scans Riddrie, 4D Scan Riddrie, 3D Scan Riddrie, Gender Scan Riddrie, Baby Scan Riddrie, Pregnancy Scan Riddrie, Early Pregnancy Scan Riddrie, Private Ultrasound Scan Riddrie, Reassurance Scans Riddrie, Early Viability Scans Riddrie, Dating Scans Riddrie. Private Baby Scans Robroyston, Private Baby Ultrasound Scans Robroyston, Private Pregnancy Scans Robroyston, Private Well Being And Reassurance Scans Robroyston, Private Gender/Sexing Scans Robroyston, Private 3D/4D Scans Robroyston, Private Early Pregnancy Scans Robroyston, Private Growth And Presentation Scans Robroyston, 4D Scan Robroyston, 3D Scan Robroyston, Gender Scan Robroyston, Baby Scan Robroyston, Pregnancy Scan Robroyston, Early Pregnancy Scan Robroyston, Private Ultrasound Scan Robroyston, Reassurance Scans Robroyston, Early Viability Scans Robroyston, Dating Scans Robroyston. Private Baby Scans Royston, Private Baby Ultrasound Scans Royston, Private Pregnancy Scans Royston, Private Well Being And Reassurance Scans Royston, Private Gender/Sexing Scans Royston, Private 3D/4D Scans Royston, Private Early Pregnancy Scans Royston, Private Growth And Presentation Scans Royston, 4D Scan Royston, 3D Scan Royston, Gender Scan Royston, Baby Scan Royston, Pregnancy Scan Royston, Early Pregnancy Scan Royston, Private Ultrasound Scan Royston, Reassurance Scans Royston, Early Viability Scans Royston, Dating Scans Royston. Private Baby Scans Ruchazie, Private Baby Ultrasound Scans Ruchazie, Private Pregnancy Scans Ruchazie, Private Well Being And Reassurance Scans Ruchazie, Private Gender/Sexing Scans Ruchazie, Private 3D/4D Scans Ruchazie, Private Early Pregnancy Scans Ruchazie, Private Growth And Presentation Scans Ruchazie, 4D Scan Ruchazie, 3D Scan Ruchazie, Gender Scan Ruchazie, Baby Scan Ruchazie, Pregnancy Scan Ruchazie, Early Pregnancy Scan Ruchazie, Private Ultrasound Scan Ruchazie, Reassurance Scans Ruchazie, Early Viability Scans Ruchazie, Dating Scans Ruchazie. Private Baby Scans Ruchill, Private Baby Ultrasound Scans Ruchill, Private Pregnancy Scans Ruchill, Private Well Being And Reassurance Scans Ruchill, Private Gender/Sexing Scans Ruchill, Private 3D/4D Scans Ruchill, Private Early Pregnancy Scans Ruchill, Private Growth And Presentation Scans Ruchill, 4D Scan Ruchill, 3D Scan Ruchill, Gender Scan Ruchill, Baby Scan Ruchill, Pregnancy Scan Ruchill, Early Pregnancy Scan Ruchill, Private Ultrasound Scan Ruchill, Reassurance Scans Ruchill, Early Viability Scans Ruchill, Dating Scans Ruchill. Private Baby Scans Sandyhills, Private Baby Ultrasound Scans Sandyhills, Private Pregnancy Scans Sandyhills, Private Well Being And Reassurance Scans Sandyhills, Private Gender/Sexing Scans Sandyhills, Private 3D/4D Scans Sandyhills, Private Early Pregnancy Scans Sandyhills, Private Growth And Presentation Scans Sandyhills, 4D Scan Sandyhills, 3D Scan Sandyhills, Gender Scan Sandyhills, Baby Scan Sandyhills, Pregnancy Scan Sandyhills, Early Pregnancy Scan Sandyhills, Private Ultrasound Scan Sandyhills, Reassurance Scans Sandyhills, Early Viability Scans Sandyhills, Dating Scans Sandyhills. Private Baby Scans Scotstoun, Private Baby Ultrasound Scans Scotstoun, Private Pregnancy Scans Scotstoun, Private Well Being And Reassurance Scans Scotstoun, Private Gender/Sexing Scans Scotstoun, Private 3D/4D Scans Scotstoun, Private Early Pregnancy Scans Scotstoun, Private Growth And Presentation Scans Scotstoun, 4D Scan Scotstoun, 3D Scan Scotstoun, Gender Scan Scotstoun, Baby Scan Scotstoun, Pregnancy Scan Scotstoun, Early Pregnancy Scan Scotstoun, Private Ultrasound Scan Scotstoun, Reassurance Scans Scotstoun, Early Viability Scans Scotstoun, Dating Scans Scotstoun. Private Baby Scans Scotstounhill, Private Baby Ultrasound Scans Scotstounhill, Private Pregnancy Scans Scotstounhill, Private Well Being And Reassurance Scans Scotstounhill, Private Gender/Sexing Scans Scotstounhill, Private 3D/4D Scans Scotstounhill, Private Early Pregnancy Scans Scotstounhill, Private Growth And Presentation Scans Scotstounhill, 4D Scan Scotstounhill, 3D Scan Scotstounhill, Gender Scan Scotstounhill, Baby Scan Scotstounhill, Pregnancy Scan Scotstounhill, Early Pregnancy Scan Scotstounhill, Private Ultrasound Scan Scotstounhill, Reassurance Scans Scotstounhill, Early Viability Scans Scotstounhill, Dating Scans Scotstounhill. Private Baby Scans Shettleston, Private Baby Ultrasound Scans Shettleston, Private Pregnancy Scans Shettleston, Private Well Being And Reassurance Scans Shettleston, Private Gender/Sexing Scans Shettleston, Private 3D/4D Scans Shettleston, Private Early Pregnancy Scans Shettleston, Private Growth And Presentation Scans Shettleston, 4D Scan Shettleston, 3D Scan Shettleston, Gender Scan Shettleston, Baby Scan Shettleston, Pregnancy Scan Shettleston, Early Pregnancy Scan Shettleston, Private Ultrasound Scan Shettleston, Reassurance Scans Shettleston, Early Viability Scans Shettleston, Dating Scans Shettleston. Private Baby Scans Sighthill, Private Baby Ultrasound Scans Sighthill, Private Pregnancy Scans Sighthill, Private Well Being And Reassurance Scans Sighthill, Private Gender/Sexing Scans Sighthill, Private 3D/4D Scans Sighthill, Private Early Pregnancy Scans Sighthill, Private Growth And Presentation Scans Sighthill, 4D Scan Sighthill, 3D Scan Sighthill, Gender Scan Sighthill, Baby Scan Sighthill, Pregnancy Scan Sighthill, Early Pregnancy Scan Sighthill, Private Ultrasound Scan Sighthill, Reassurance Scans Sighthill, Early Viability Scans Sighthill, Dating Scans Sighthill. Private Baby Scans Springboig, Private Baby Ultrasound Scans Springboig, Private Pregnancy Scans Springboig, Private Well Being And Reassurance Scans Springboig, Private Gender/Sexing Scans Springboig, Private 3D/4D Scans Springboig, Private Early Pregnancy Scans Springboig, Private Growth And Presentation Scans Springboig, 4D Scan Springboig, 3D Scan Springboig, Gender Scan Springboig, Baby Scan Springboig, Pregnancy Scan Springboig, Early Pregnancy Scan Springboig, Private Ultrasound Scan Springboig, Reassurance Scans Springboig, Early Viability Scans Springboig, Dating Scans Springboig. Private Baby Scans Springburn, Private Baby Ultrasound Scans Springburn, Private Pregnancy Scans Springburn, Private Well Being And Reassurance Scans Springburn, Private Gender/Sexing Scans Springburn, Private 3D/4D Scans Springburn, Private Early Pregnancy Scans Springburn, Private Growth And Presentation Scans Springburn, 4D Scan Springburn, 3D Scan Springburn, Gender Scan Springburn, Baby Scan Springburn, Pregnancy Scan Springburn, Early Pregnancy Scan Springburn, Private Ultrasound Scan Springburn, Reassurance Scans Springburn, Early Viability Scans Springburn, Dating Scans Springburn. Private Baby Scans Springhill, Private Baby Ultrasound Scans Springhill, Private Pregnancy Scans Springhill, Private Well Being And Reassurance Scans Springhill, Private Gender/Sexing Scans Springhill, Private 3D/4D Scans Springhill, Private Early Pregnancy Scans Springhill, Private Growth And Presentation Scans Springhill, 4D Scan Springhill, 3D Scan Springhill, Gender Scan Springhill, Baby Scan Springhill, Pregnancy Scan Springhill, Early Pregnancy Scan Springhill, Private Ultrasound Scan Springhill, Reassurance Scans Springhill, Early Viability Scans Springhill, Dating Scans Springhill. Private Baby Scans Stobhill, Private Baby Ultrasound Scans Stobhill, Private Pregnancy Scans Stobhill, Private Well Being And Reassurance Scans Stobhill, Private Gender/Sexing Scans Stobhill, Private 3D/4D Scans Stobhill, Private Early Pregnancy Scans Stobhill, Private Growth And Presentation Scans Stobhill, 4D Scan Stobhill, 3D Scan Stobhill, Gender Scan Stobhill, Baby Scan Stobhill, Pregnancy Scan Stobhill, Early Pregnancy Scan Stobhill, Private Ultrasound Scan Stobhill, Reassurance Scans Stobhill, Early Viability Scans Stobhill, Dating Scans Stobhill. Private Baby Scans Summerston, Private Baby Ultrasound Scans Summerston, Private Pregnancy Scans Summerston, Private Well Being And Reassurance Scans Summerston, Private Gender/Sexing Scans Summerston, Private 3D/4D Scans Summerston, Private Early Pregnancy Scans Summerston, Private Growth And Presentation Scans Summerston, 4D Scan Summerston, 3D Scan Summerston, Gender Scan Summerston, Baby Scan Summerston, Pregnancy Scan Summerston, Early Pregnancy Scan Summerston, Private Ultrasound Scan Summerston, Reassurance Scans Summerston, Early Viability Scans Summerston, Dating Scans Summerston. Private Baby Scans Swinton, Private Baby Ultrasound Scans Swinton, Private Pregnancy Scans Swinton, Private Well Being And Reassurance Scans Swinton, Private Gender/Sexing Scans Swinton, Private 3D/4D Scans Swinton, Private Early Pregnancy Scans Swinton, Private Growth And Presentation Scans Swinton, 4D Scan Swinton, 3D Scan Swinton, Gender Scan Swinton, Baby Scan Swinton, Pregnancy Scan Swinton, Early Pregnancy Scan Swinton, Private Ultrasound Scan Swinton, Reassurance Scans Swinton, Early Viability Scans Swinton, Dating Scans Swinton. Private Baby Scans Temple, Private Baby Ultrasound Scans Temple, Private Pregnancy Scans Temple, Private Well Being And Reassurance Scans Temple, Private Gender/Sexing Scans Temple, Private 3D/4D Scans Temple, Private Early Pregnancy Scans Temple, Private Growth And Presentation Scans Temple, 4D Scan Temple, 3D Scan Temple, Gender Scan Temple, Baby Scan Temple, Pregnancy Scan Temple, Early Pregnancy Scan Temple, Private Ultrasound Scan Temple, Reassurance Scans Temple, Early Viability Scans Temple, Dating Scans Temple. Private Baby Scans Tollcross, Private Baby Ultrasound Scans Tollcross, Private Pregnancy Scans Tollcross, Private Well Being And Reassurance Scans Tollcross, Private Gender/Sexing Scans Tollcross, Private 3D/4D Scans Tollcross, Private Early Pregnancy Scans Tollcross, Private Growth And Presentation Scans Tollcross, 4D Scan Tollcross, 3D Scan Tollcross, Gender Scan Tollcross, Baby Scan Tollcross, Pregnancy Scan Tollcross, Early Pregnancy Scan Tollcross, Private Ultrasound Scan Tollcross, Reassurance Scans Tollcross, Early Viability Scans Tollcross, Dating Scans Tollcross. Private Baby Scans Townhead, Private Baby Ultrasound Scans Townhead, Private Pregnancy Scans Townhead, Private Well Being And Reassurance Scans Townhead, Private Gender/Sexing Scans Townhead, Private 3D/4D Scans Townhead, Private Early Pregnancy Scans Townhead, Private Growth And Presentation Scans Townhead, 4D Scan Townhead, 3D Scan Townhead, Gender Scan Townhead, Baby Scan Townhead, Pregnancy Scan Townhead, Early Pregnancy Scan Townhead, Private Ultrasound Scan Townhead, Reassurance Scans Townhead, Early Viability Scans Townhead, Dating Scans Townhead. Private Baby Scans Whiteinch, Private Baby Ultrasound Scans Whiteinch, Private Pregnancy Scans Whiteinch, Private Well Being And Reassurance Scans Whiteinch, Private Gender/Sexing Scans Whiteinch, Private 3D/4D Scans Whiteinch, Private Early Pregnancy Scans Whiteinch, Private Growth And Presentation Scans Whiteinch, 4D Scan Whiteinch, 3D Scan Whiteinch, Gender Scan Whiteinch, Baby Scan Whiteinch, Pregnancy Scan Whiteinch, Early Pregnancy Scan Whiteinch, Private Ultrasound Scan Whiteinch, Reassurance Scans Whiteinch, Early Viability Scans Whiteinch, Dating Scans Whiteinch. Private Baby Scans Woodlands, Private Baby Ultrasound Scans Woodlands, Private Pregnancy Scans Woodlands, Private Well Being And Reassurance Scans Woodlands, Private Gender/Sexing Scans Woodlands, Private 3D/4D Scans Woodlands, Private Early Pregnancy Scans Woodlands, Private Growth And Presentation Scans Woodlands, 4D Scan Woodlands, 3D Scan Woodlands, Gender Scan Woodlands, Baby Scan Woodlands, Pregnancy Scan Woodlands, Early Pregnancy Scan Woodlands, Private Ultrasound Scan Woodlands, Reassurance Scans Woodlands, Early Viability Scans Woodlands, Dating Scans Woodlands. Private Baby Scans Yoker, Private Baby Ultrasound Scans Yoker, Private Pregnancy Scans Yoker, Private Well Being And Reassurance Scans Yoker, Private Gender/Sexing Scans Yoker, Private 3D/4D Scans Yoker, Private Early Pregnancy Scans Yoker, Private Growth And Presentation Scans Yoker, 4D Scan Yoker, 3D Scan Yoker, Gender Scan Yoker, Baby Scan Yoker, Pregnancy Scan Yoker, Early Pregnancy Scan Yoker, Private Ultrasound Scan Yoker, Reassurance Scans Yoker, Early Viability Scans Yoker, Dating Scans Yoker. Private Baby Scans Yorkhill, Private Baby Ultrasound Scans Yorkhill, Private Pregnancy Scans Yorkhill, Private Well Being And Reassurance Scans Yorkhill, Private Gender/Sexing Scans Yorkhill, Private 3D/4D Scans Yorkhill, Private Early Pregnancy Scans Yorkhill, Private Growth And Presentation Scans Yorkhill, 4D Scan Yorkhill, 3D Scan Yorkhill, Gender Scan Yorkhill, Baby Scan Yorkhill, Pregnancy Scan Yorkhill, Early Pregnancy Scan Yorkhill, Private Ultrasound Scan Yorkhill, Reassurance Scans Yorkhill, Early Viability Scans Yorkhill, Dating Scans Yorkhill. Private Baby Scans Arden, Private Baby Ultrasound Scans Arden, Private Pregnancy Scans Arden, Private Well Being And Reassurance Scans Arden, Private Gender/Sexing Scans Arden, Private 3D/4D Scans Arden, Private Early Pregnancy Scans Arden, Private Growth And Presentation Scans Arden, 4D Scan Arden, 3D Scan Arden, Gender Scan Arden, Baby Scan Arden, Pregnancy Scan Arden, Early Pregnancy Scan Arden, Private Ultrasound Scan Arden, Reassurance Scans Arden, Early Viability Scans Arden, Dating Scans Arden. Private Baby Scans Auldhouse, Private Baby Ultrasound Scans Auldhouse, Private Pregnancy Scans Auldhouse, Private Well Being And Reassurance Scans Auldhouse, Private Gender/Sexing Scans Auldhouse, Private 3D/4D Scans Auldhouse, Private Early Pregnancy Scans Auldhouse, Private Growth And Presentation Scans Auldhouse, 4D Scan Auldhouse, 3D Scan Auldhouse, Gender Scan Auldhouse, Baby Scan Auldhouse, Pregnancy Scan Auldhouse, Early Pregnancy Scan Auldhouse, Private Ultrasound Scan Auldhouse, Reassurance Scans Auldhouse, Early Viability Scans Auldhouse, Dating Scans Auldhouse. Private Baby Scans Battlefield, Private Baby Ultrasound Scans Battlefield, Private Pregnancy Scans Battlefield, Private Well Being And Reassurance Scans Battlefield, Private Gender/Sexing Scans Battlefield, Private 3D/4D Scans Battlefield, Private Early Pregnancy Scans Battlefield, Private Growth And Presentation Scans Battlefield, 4D Scan Battlefield, 3D Scan Battlefield, Gender Scan Battlefield, Baby Scan Battlefield, Pregnancy Scan Battlefield, Early Pregnancy Scan Battlefield, Private Ultrasound Scan Battlefield, Reassurance Scans Battlefield, Early Viability Scans Battlefield, Dating Scans Battlefield. Private Baby Scans Bellahouston, Private Baby Ultrasound Scans Bellahouston, Private Pregnancy Scans Bellahouston, Private Well Being And Reassurance Scans Bellahouston, Private Gender/Sexing Scans Bellahouston, Private 3D/4D Scans Bellahouston, Private Early Pregnancy Scans Bellahouston, Private Growth And Presentation Scans Bellahouston, 4D Scan Bellahouston, 3D Scan Bellahouston, Gender Scan Bellahouston, Baby Scan Bellahouston, Pregnancy Scan Bellahouston, Early Pregnancy Scan Bellahouston, Private Ultrasound Scan Bellahouston, Reassurance Scans Bellahouston, Early Viability Scans Bellahouston, Dating Scans Bellahouston. Private Baby Scans Cardonald, Private Baby Ultrasound Scans Cardonald, Private Pregnancy Scans Cardonald, Private Well Being And Reassurance Scans Cardonald, Private Gender/Sexing Scans Cardonald, Private 3D/4D Scans Cardonald, Private Early Pregnancy Scans Cardonald, Private Growth And Presentation Scans Cardonald, 4D Scan Cardonald, 3D Scan Cardonald, Gender Scan Cardonald, Baby Scan Cardonald, Pregnancy Scan Cardonald, Early Pregnancy Scan Cardonald, Private Ultrasound Scan Cardonald, Reassurance Scans Cardonald, Early Viability Scans Cardonald, Dating Scans Cardonald. Private Baby Scans Carmunnock, Private Baby Ultrasound Scans Carmunnock, Private Pregnancy Scans Carmunnock, Private Well Being And Reassurance Scans Carmunnock, Private Gender/Sexing Scans Carmunnock, Private 3D/4D Scans Carmunnock, Private Early Pregnancy Scans Carmunnock, Private Growth And Presentation Scans Carmunnock, 4D Scan Carmunnock, 3D Scan Carmunnock, Gender Scan Carmunnock, Baby Scan Carmunnock, Pregnancy Scan Carmunnock, Early Pregnancy Scan Carmunnock, Private Ultrasound Scan Carmunnock, Reassurance Scans Carmunnock, Early Viability Scans Carmunnock, Dating Scans Carmunnock. Private Baby Scans Carnwadric, Private Baby Ultrasound Scans Carnwadric, Private Pregnancy Scans Carnwadric, Private Well Being And Reassurance Scans Carnwadric, Private Gender/Sexing Scans Carnwadric, Private 3D/4D Scans Carnwadric, Private Early Pregnancy Scans Carnwadric, Private Growth And Presentation Scans Carnwadric, 4D Scan Carnwadric, 3D Scan Carnwadric, Gender Scan Carnwadric, Baby Scan Carnwadric, Pregnancy Scan Carnwadric, Early Pregnancy Scan Carnwadric, Private Ultrasound Scan Carnwadric, Reassurance Scans Carnwadric, Early Viability Scans Carnwadric, Dating Scans Carnwadric. Private Baby Scans Castlemilk, Private Baby Ultrasound Scans Castlemilk, Private Pregnancy Scans Castlemilk, Private Well Being And Reassurance Scans Castlemilk, Private Gender/Sexing Scans Castlemilk, Private 3D/4D Scans Castlemilk, Private Early Pregnancy Scans Castlemilk, Private Growth And Presentation Scans Castlemilk, 4D Scan Castlemilk, 3D Scan Castlemilk, Gender Scan Castlemilk, Baby Scan Castlemilk, Pregnancy Scan Castlemilk, Early Pregnancy Scan Castlemilk, Private Ultrasound Scan Castlemilk, Reassurance Scans Castlemilk, Early Viability Scans Castlemilk, Dating Scans Castlemilk. Private Baby Scans Cathcart, Private Baby Ultrasound Scans Cathcart, Private Pregnancy Scans Cathcart, Private Well Being And Reassurance Scans Cathcart, Private Gender/Sexing Scans Cathcart, Private 3D/4D Scans Cathcart, Private Early Pregnancy Scans Cathcart, Private Growth And Presentation Scans Cathcart, 4D Scan Cathcart, 3D Scan Cathcart, Gender Scan Cathcart, Baby Scan Cathcart, Pregnancy Scan Cathcart, Early Pregnancy Scan Cathcart, Private Ultrasound Scan Cathcart, Reassurance Scans Cathcart, Early Viability Scans Cathcart, Dating Scans Cathcart. Private Baby Scans Cessnock, Private Baby Ultrasound Scans Cessnock, Private Pregnancy Scans Cessnock, Private Well Being And Reassurance Scans Cessnock, Private Gender/Sexing Scans Cessnock, Private 3D/4D Scans Cessnock, Private Early Pregnancy Scans Cessnock, Private Growth And Presentation Scans Cessnock, 4D Scan Cessnock, 3D Scan Cessnock, Gender Scan Cessnock, Baby Scan Cessnock, Pregnancy Scan Cessnock, Early Pregnancy Scan Cessnock, Private Ultrasound Scan Cessnock, Reassurance Scans Cessnock, Early Viability Scans Cessnock, Dating Scans Cessnock. Private Baby Scans Corkerhill, Private Baby Ultrasound Scans Corkerhill, Private Pregnancy Scans Corkerhill, Private Well Being And Reassurance Scans Corkerhill, Private Gender/Sexing Scans Corkerhill, Private 3D/4D Scans Corkerhill, Private Early Pregnancy Scans Corkerhill, Private Growth And Presentation Scans Corkerhill, 4D Scan Corkerhill, 3D Scan Corkerhill, Gender Scan Corkerhill, Baby Scan Corkerhill, Pregnancy Scan Corkerhill, Early Pregnancy Scan Corkerhill, Private Ultrasound Scan Corkerhill, Reassurance Scans Corkerhill, Early Viability Scans Corkerhill, Dating Scans Corkerhill. Private Baby Scans Cowglen, Private Baby Ultrasound Scans Cowglen, Private Pregnancy Scans Cowglen, Private Well Being And Reassurance Scans Cowglen, Private Gender/Sexing Scans Cowglen, Private 3D/4D Scans Cowglen, Private Early Pregnancy Scans Cowglen, Private Growth And Presentation Scans Cowglen, 4D Scan Cowglen, 3D Scan Cowglen, Gender Scan Cowglen, Baby Scan Cowglen, Pregnancy Scan Cowglen, Early Pregnancy Scan Cowglen, Private Ultrasound Scan Cowglen, Reassurance Scans Cowglen, Early Viability Scans Cowglen, Dating Scans Cowglen. Private Baby Scans Craigton, Private Baby Ultrasound Scans Craigton, Private Pregnancy Scans Craigton, Private Well Being And Reassurance Scans Craigton, Private Gender/Sexing Scans Craigton, Private 3D/4D Scans Craigton, Private Early Pregnancy Scans Craigton, Private Growth And Presentation Scans Craigton, 4D Scan Craigton, 3D Scan Craigton, Gender Scan Craigton, Baby Scan Craigton, Pregnancy Scan Craigton, Early Pregnancy Scan Craigton, Private Ultrasound Scan Craigton, Reassurance Scans Craigton, Early Viability Scans Craigton, Dating Scans Craigton. Private Baby Scans Croftfoot, Private Baby Ultrasound Scans Croftfoot, Private Pregnancy Scans Croftfoot, Private Well Being And Reassurance Scans Croftfoot, Private Gender/Sexing Scans Croftfoot, Private 3D/4D Scans Croftfoot, Private Early Pregnancy Scans Croftfoot, Private Growth And Presentation Scans Croftfoot, 4D Scan Croftfoot, 3D Scan Croftfoot, Gender Scan Croftfoot, Baby Scan Croftfoot, Pregnancy Scan Croftfoot, Early Pregnancy Scan Croftfoot, Private Ultrasound Scan Croftfoot, Reassurance Scans Croftfoot, Early Viability Scans Croftfoot, Dating Scans Croftfoot. Private Baby Scans Crookston, Private Baby Ultrasound Scans Crookston, Private Pregnancy Scans Crookston, Private Well Being And Reassurance Scans Crookston, Private Gender/Sexing Scans Crookston, Private 3D/4D Scans Crookston, Private Early Pregnancy Scans Crookston, Private Growth And Presentation Scans Crookston, 4D Scan Crookston, 3D Scan Crookston, Gender Scan Crookston, Baby Scan Crookston, Pregnancy Scan Crookston, Early Pregnancy Scan Crookston, Private Ultrasound Scan Crookston, Reassurance Scans Crookston, Early Viability Scans Crookston, Dating Scans Crookston. Private Baby Scans Crosshill, Private Baby Ultrasound Scans Crosshill, Private Pregnancy Scans Crosshill, Private Well Being And Reassurance Scans Crosshill, Private Gender/Sexing Scans Crosshill, Private 3D/4D Scans Crosshill, Private Early Pregnancy Scans Crosshill, Private Growth And Presentation Scans Crosshill, 4D Scan Crosshill, 3D Scan Crosshill, Gender Scan Crosshill, Baby Scan Crosshill, Pregnancy Scan Crosshill, Early Pregnancy Scan Crosshill, Private Ultrasound Scan Crosshill, Reassurance Scans Crosshill, Early Viability Scans Crosshill, Dating Scans Crosshill. Private Baby Scans Crossmyloof, Private Baby Ultrasound Scans Crossmyloof, Private Pregnancy Scans Crossmyloof, Private Well Being And Reassurance Scans Crossmyloof, Private Gender/Sexing Scans Crossmyloof, Private 3D/4D Scans Crossmyloof, Private Early Pregnancy Scans Crossmyloof, Private Growth And Presentation Scans Crossmyloof, 4D Scan Crossmyloof, 3D Scan Crossmyloof, Gender Scan Crossmyloof, Baby Scan Crossmyloof, Pregnancy Scan Crossmyloof, Early Pregnancy Scan Crossmyloof, Private Ultrasound Scan Crossmyloof, Reassurance Scans Crossmyloof, Early Viability Scans Crossmyloof, Dating Scans Crossmyloof. Private Baby Scans Darnley, Private Baby Ultrasound Scans Darnley, Private Pregnancy Scans Darnley, Private Well Being And Reassurance Scans Darnley, Private Gender/Sexing Scans Darnley, Private 3D/4D Scans Darnley, Private Early Pregnancy Scans Darnley, Private Growth And Presentation Scans Darnley, 4D Scan Darnley, 3D Scan Darnley, Gender Scan Darnley, Baby Scan Darnley, Pregnancy Scan Darnley, Early Pregnancy Scan Darnley, Private Ultrasound Scan Darnley, Reassurance Scans Darnley, Early Viability Scans Darnley, Dating Scans Darnley. Private Baby Scans Deaconsbank, Private Baby Ultrasound Scans Deaconsbank, Private Pregnancy Scans Deaconsbank, Private Well Being And Reassurance Scans Deaconsbank, Private Gender/Sexing Scans Deaconsbank, Private 3D/4D Scans Deaconsbank, Private Early Pregnancy Scans Deaconsbank, Private Growth And Presentation Scans Deaconsbank, 4D Scan Deaconsbank, 3D Scan Deaconsbank, Gender Scan Deaconsbank, Baby Scan Deaconsbank, Pregnancy Scan Deaconsbank, Early Pregnancy Scan Deaconsbank, Private Ultrasound Scan Deaconsbank, Reassurance Scans Deaconsbank, Early Viability Scans Deaconsbank, Dating Scans Deaconsbank. Private Baby Scans Drumoyne, Private Baby Ultrasound Scans Drumoyne, Private Pregnancy Scans Drumoyne, Private Well Being And Reassurance Scans Drumoyne, Private Gender/Sexing Scans Drumoyne, Private 3D/4D Scans Drumoyne, Private Early Pregnancy Scans Drumoyne, Private Growth And Presentation Scans Drumoyne, 4D Scan Drumoyne, 3D Scan Drumoyne, Gender Scan Drumoyne, Baby Scan Drumoyne, Pregnancy Scan Drumoyne, Early Pregnancy Scan Drumoyne, Private Ultrasound Scan Drumoyne, Reassurance Scans Drumoyne, Early Viability Scans Drumoyne, Dating Scans Drumoyne. Private Baby Scans Dumbreck, Private Baby Ultrasound Scans Dumbreck, Private Pregnancy Scans Dumbreck, Private Well Being And Reassurance Scans Dumbreck, Private Gender/Sexing Scans Dumbreck, Private 3D/4D Scans Dumbreck, Private Early Pregnancy Scans Dumbreck, Private Growth And Presentation Scans Dumbreck, 4D Scan Dumbreck, 3D Scan Dumbreck, Gender Scan Dumbreck, Baby Scan Dumbreck, Pregnancy Scan Dumbreck, Early Pregnancy Scan Dumbreck, Private Ultrasound Scan Dumbreck, Reassurance Scans Dumbreck, Early Viability Scans Dumbreck, Dating Scans Dumbreck. Private Baby Scans Govan, Private Baby Ultrasound Scans Govan, Private Pregnancy Scans Govan, Private Well Being And Reassurance Scans Govan, Private Gender/Sexing Scans Govan, Private 3D/4D Scans Govan, Private Early Pregnancy Scans Govan, Private Growth And Presentation Scans Govan, 4D Scan Govan, 3D Scan Govan, Gender Scan Govan, Baby Scan Govan, Pregnancy Scan Govan, Early Pregnancy Scan Govan, Private Ultrasound Scan Govan, Reassurance Scans Govan, Early Viability Scans Govan, Dating Scans Govan. Private Baby Scans Govanhill, Private Baby Ultrasound Scans Govanhill, Private Pregnancy Scans Govanhill, Private Well Being And Reassurance Scans Govanhill, Private Gender/Sexing Scans Govanhill, Private 3D/4D Scans Govanhill, Private Early Pregnancy Scans Govanhill, Private Growth And Presentation Scans Govanhill, 4D Scan Govanhill, 3D Scan Govanhill, Gender Scan Govanhill, Baby Scan Govanhill, Pregnancy Scan Govanhill, Early Pregnancy Scan Govanhill, Private Ultrasound Scan Govanhill, Reassurance Scans Govanhill, Early Viability Scans Govanhill, Dating Scans Govanhill. Private Baby Scans Gorbals, Private Baby Ultrasound Scans Gorbals, Private Pregnancy Scans Gorbals, Private Well Being And Reassurance Scans Gorbals, Private Gender/Sexing Scans Gorbals, Private 3D/4D Scans Gorbals, Private Early Pregnancy Scans Gorbals, Private Growth And Presentation Scans Gorbals, 4D Scan Gorbals, 3D Scan Gorbals, Gender Scan Gorbals, Baby Scan Gorbals, Pregnancy Scan Gorbals, Early Pregnancy Scan Gorbals, Private Ultrasound Scan Gorbals, Reassurance Scans Gorbals, Early Viability Scans Gorbals, Dating Scans Gorbals. Private Baby Scans Halfway, Private Baby Ultrasound Scans Halfway, Private Pregnancy Scans Halfway, Private Well Being And Reassurance Scans Halfway, Private Gender/Sexing Scans Halfway, Private 3D/4D Scans Halfway, Private Early Pregnancy Scans Halfway, Private Growth And Presentation Scans Halfway, 4D Scan Halfway, 3D Scan Halfway, Gender Scan Halfway, Baby Scan Halfway, Pregnancy Scan Halfway, Early Pregnancy Scan Halfway, Private Ultrasound Scan Halfway, Reassurance Scans Halfway, Early Viability Scans Halfway, Dating Scans Halfway. Private Baby Scans Hillington, Private Baby Ultrasound Scans Hillington, Private Pregnancy Scans Hillington, Private Well Being And Reassurance Scans Hillington, Private Gender/Sexing Scans Hillington, Private 3D/4D Scans Hillington, Private Early Pregnancy Scans Hillington, Private Growth And Presentation Scans Hillington, 4D Scan Hillington, 3D Scan Hillington, Gender Scan Hillington, Baby Scan Hillington, Pregnancy Scan Hillington, Early Pregnancy Scan Hillington, Private Ultrasound Scan Hillington, Reassurance Scans Hillington, Early Viability Scans Hillington, Dating Scans Hillington. Private Baby Scans Hillpark, Private Baby Ultrasound Scans Hillpark, Private Pregnancy Scans Hillpark, Private Well Being And Reassurance Scans Hillpark, Private Gender/Sexing Scans Hillpark, Private 3D/4D Scans Hillpark, Private Early Pregnancy Scans Hillpark, Private Growth And Presentation Scans Hillpark, 4D Scan Hillpark, 3D Scan Hillpark, Gender Scan Hillpark, Baby Scan Hillpark, Pregnancy Scan Hillpark, Early Pregnancy Scan Hillpark, Private Ultrasound Scan Hillpark, Reassurance Scans Hillpark, Early Viability Scans Hillpark, Dating Scans Hillpark. Private Baby Scans Hurlet, Private Baby Ultrasound Scans Hurlet, Private Pregnancy Scans Hurlet, Private Well Being And Reassurance Scans Hurlet, Private Gender/Sexing Scans Hurlet, Private 3D/4D Scans Hurlet, Private Early Pregnancy Scans Hurlet, Private Growth And Presentation Scans Hurlet, 4D Scan Hurlet, 3D Scan Hurlet, Gender Scan Hurlet, Baby Scan Hurlet, Pregnancy Scan Hurlet, Early Pregnancy Scan Hurlet, Private Ultrasound Scan Hurlet, Reassurance Scans Hurlet, Early Viability Scans Hurlet, Dating Scans Hurlet. Private Baby Scans Hutchesontown, Private Baby Ultrasound Scans Hutchesontown, Private Pregnancy Scans Hutchesontown, Private Well Being And Reassurance Scans Hutchesontown, Private Gender/Sexing Scans Hutchesontown, Private 3D/4D Scans Hutchesontown, Private Early Pregnancy Scans Hutchesontown, Private Growth And Presentation Scans Hutchesontown, 4D Scan Hutchesontown, 3D Scan Hutchesontown, Gender Scan Hutchesontown, Baby Scan Hutchesontown, Pregnancy Scan Hutchesontown, Early Pregnancy Scan Hutchesontown, Private Ultrasound Scan Hutchesontown, Reassurance Scans Hutchesontown, Early Viability Scans Hutchesontown, Dating Scans Hutchesontown. Private Baby Scans Ibrox, Private Baby Ultrasound Scans Ibrox, Private Pregnancy Scans Ibrox, Private Well Being And Reassurance Scans Ibrox, Private Gender/Sexing Scans Ibrox, Private 3D/4D Scans Ibrox, Private Early Pregnancy Scans Ibrox, Private Growth And Presentation Scans Ibrox, 4D Scan Ibrox, 3D Scan Ibrox, Gender Scan Ibrox, Baby Scan Ibrox, Pregnancy Scan Ibrox, Early Pregnancy Scan Ibrox, Private Ultrasound Scan Ibrox, Reassurance Scans Ibrox, Early Viability Scans Ibrox, Dating Scans Ibrox. Private Baby Scans Jenny Lind, Private Baby Ultrasound Scans Jenny Lind, Private Pregnancy Scans Jenny Lind, Private Well Being And Reassurance Scans Jenny Lind, Private Gender/Sexing Scans Jenny Lind, Private 3D/4D Scans Jenny Lind, Private Early Pregnancy Scans Jenny Lind, Private Growth And Presentation Scans Jenny Lind, 4D Scan Jenny Lind, 3D Scan Jenny Lind, Gender Scan Jenny Lind, Baby Scan Jenny Lind, Pregnancy Scan Jenny Lind, Early Pregnancy Scan Jenny Lind, Private Ultrasound Scan Jenny Lind, Reassurance Scans Jenny Lind, Early Viability Scans Jenny Lind, Dating Scans Jenny Lind. Private Baby Scans Kennishead, Private Baby Ultrasound Scans Kennishead, Private Pregnancy Scans Kennishead, Private Well Being And Reassurance Scans Kennishead, Private Gender/Sexing Scans Kennishead, Private 3D/4D Scans Kennishead, Private Early Pregnancy Scans Kennishead, Private Growth And Presentation Scans Kennishead, 4D Scan Kennishead, 3D Scan Kennishead, Gender Scan Kennishead, Baby Scan Kennishead, Pregnancy Scan Kennishead, Early Pregnancy Scan Kennishead, Private Ultrasound Scan Kennishead, Reassurance Scans Kennishead, Early Viability Scans Kennishead, Dating Scans Kennishead. Private Baby Scans King’s Park, Private Baby Ultrasound Scans King’s Park, Private Pregnancy Scans King’s Park, Private Well Being And Reassurance Scans King’s Park, Private Gender/Sexing Scans King’s Park, Private 3D/4D Scans King’s Park, Private Early Pregnancy Scans King’s Park, Private Growth And Presentation Scans King’s Park, 4D Scan King’s Park, 3D Scan King’s Park, Gender Scan King’s Park, Baby Scan King’s Park, Pregnancy Scan King’s Park, Early Pregnancy Scan King’s Park, Private Ultrasound Scan King’s Park, Reassurance Scans King’s Park, Early Viability Scans King’s Park, Dating Scans King’s Park. Private Baby Scans Kinning Park, Private Baby Ultrasound Scans Kinning Park, Private Pregnancy Scans Kinning Park, Private Well Being And Reassurance Scans Kinning Park, Private Gender/Sexing Scans Kinning Park, Private 3D/4D Scans Kinning Park, Private Early Pregnancy Scans Kinning Park, Private Growth And Presentation Scans Kinning Park, 4D Scan Kinning Park, 3D Scan Kinning Park, Gender Scan Kinning Park, Baby Scan Kinning Park, Pregnancy Scan Kinning Park, Early Pregnancy Scan Kinning Park, Private Ultrasound Scan Kinning Park, Reassurance Scans Kinning Park, Early Viability Scans Kinning Park, Dating Scans Kinning Park. Private Baby Scans Langside, Private Baby Ultrasound Scans Langside, Private Pregnancy Scans Langside, Private Well Being And Reassurance Scans Langside, Private Gender/Sexing Scans Langside, Private 3D/4D Scans Langside, Private Early Pregnancy Scans Langside, Private Growth And Presentation Scans Langside, 4D Scan Langside, 3D Scan Langside, Gender Scan Langside, Baby Scan Langside, Pregnancy Scan Langside, Early Pregnancy Scan Langside, Private Ultrasound Scan Langside, Reassurance Scans Langside, Early Viability Scans Langside, Dating Scans Langside. Private Baby Scans Laurieston, Private Baby Ultrasound Scans Laurieston, Private Pregnancy Scans Laurieston, Private Well Being And Reassurance Scans Laurieston, Private Gender/Sexing Scans Laurieston, Private 3D/4D Scans Laurieston, Private Early Pregnancy Scans Laurieston, Private Growth And Presentation Scans Laurieston, 4D Scan Laurieston, 3D Scan Laurieston, Gender Scan Laurieston, Baby Scan Laurieston, Pregnancy Scan Laurieston, Early Pregnancy Scan Laurieston, Private Ultrasound Scan Laurieston, Reassurance Scans Laurieston, Early Viability Scans Laurieston, Dating Scans Laurieston. Private Baby Scans Linthouse Mansewood, Private Baby Ultrasound Scans Linthouse Mansewood, Private Pregnancy Scans Linthouse Mansewood, Private Well Being And Reassurance Scans Linthouse Mansewood, Private Gender/Sexing Scans Linthouse Mansewood, Private 3D/4D Scans Linthouse Mansewood, Private Early Pregnancy Scans Linthouse Mansewood, Private Growth And Presentation Scans Linthouse Mansewood, 4D Scan Linthouse Mansewood, 3D Scan Linthouse Mansewood, Gender Scan Linthouse Mansewood, Baby Scan Linthouse Mansewood, Pregnancy Scan Linthouse Mansewood, Early Pregnancy Scan Linthouse Mansewood, Private Ultrasound Scan Linthouse Mansewood, Reassurance Scans Linthouse Mansewood, Early Viability Scans Linthouse Mansewood, Dating Scans Linthouse Mansewood. Private Baby Scans Merrylee, Private Baby Ultrasound Scans Merrylee, Private Pregnancy Scans Merrylee, Private Well Being And Reassurance Scans Merrylee, Private Gender/Sexing Scans Merrylee, Private 3D/4D Scans Merrylee, Private Early Pregnancy Scans Merrylee, Private Growth And Presentation Scans Merrylee, 4D Scan Merrylee, 3D Scan Merrylee, Gender Scan Merrylee, Baby Scan Merrylee, Pregnancy Scan Merrylee, Early Pregnancy Scan Merrylee, Private Ultrasound Scan Merrylee, Reassurance Scans Merrylee, Early Viability Scans Merrylee, Dating Scans Merrylee. Private Baby Scans Mosspark, Private Baby Ultrasound Scans Mosspark, Private Pregnancy Scans Mosspark, Private Well Being And Reassurance Scans Mosspark, Private Gender/Sexing Scans Mosspark, Private 3D/4D Scans Mosspark, Private Early Pregnancy Scans Mosspark, Private Growth And Presentation Scans Mosspark, 4D Scan Mosspark, 3D Scan Mosspark, Gender Scan Mosspark, Baby Scan Mosspark, Pregnancy Scan Mosspark, Early Pregnancy Scan Mosspark, Private Ultrasound Scan Mosspark, Reassurance Scans Mosspark, Early Viability Scans Mosspark, Dating Scans Mosspark Private Baby Scans Mount Florida, Private Baby Ultrasound Scans Mount Florida, Private Pregnancy Scans Mount Florida, Private Well Being And Reassurance Scans Mount Florida, Private Gender/Sexing Scans Mount Florida, Private 3D/4D Scans Mount Florida, Private Early Pregnancy Scans Mount Florida, Private Growth And Presentation Scans Mount Florida, 4D Scan Mount Florida, 3D Scan Mount Florida, Gender Scan Mount Florida, Baby Scan Mount Florida, Pregnancy Scan Mount Florida, Early Pregnancy Scan Mount Florida, Private Ultrasound Scan Mount Florida, Reassurance Scans Mount Florida, Early Viability Scans Mount Florida, Dating Scans Mount Florida Private Baby Scans Muirend, Private Baby Ultrasound Scans Muirend, Private Pregnancy Scans Muirend, Private Well Being And Reassurance Scans Muirend, Private Gender/Sexing Scans Muirend, Private 3D/4D Scans Muirend, Private Early Pregnancy Scans Muirend, Private Growth And Presentation Scans Muirend, 4D Scan Muirend, 3D Scan Muirend, Gender Scan Muirend, Baby Scan Muirend, Pregnancy Scan Muirend, Early Pregnancy Scan Muirend, Private Ultrasound Scan Muirend, Reassurance Scans Muirend, Early Viability Scans Muirend, Dating Scans Muirend Private Baby Scans Newlands, Private Baby Ultrasound Scans Newlands, Private Pregnancy Scans Newlands, Private Well Being And Reassurance Scans Newlands, Private Gender/Sexing Scans Newlands, Private 3D/4D Scans Newlands, Private Early Pregnancy Scans Newlands, Private Growth And Presentation Scans Newlands, 4D Scan Newlands, 3D Scan Newlands, Gender Scan Newlands, Baby Scan Newlands, Pregnancy Scan Newlands, Early Pregnancy Scan Newlands, Private Ultrasound Scan Newlands, Reassurance Scans Newlands, Early Viability Scans Newlands, Dating Scans Newlands. Private Baby Scans Nitshill, Private Baby Ultrasound Scans Nitshill, Private Pregnancy Scans Nitshill, Private Well Being And Reassurance Scans Nitshill, Private Gender/Sexing Scans Nitshill, Private 3D/4D Scans Nitshill, Private Early Pregnancy Scans Nitshill, Private Growth And Presentation Scans Nitshill, 4D Scan Nitshill, 3D Scan Nitshill, Gender Scan Nitshill, Baby Scan Nitshill, Pregnancy Scan Nitshill, Early Pregnancy Scan Nitshill, Private Ultrasound Scan Nitshill, Reassurance Scans Nitshill, Early Viability Scans Nitshill, Dating Scans Nitshill. Private Baby Scans Oatlands, Private Baby Ultrasound Scans Oatlands, Private Pregnancy Scans Oatlands, Private Well Being And Reassurance Scans Oatlands, Private Gender/Sexing Scans Oatlands, Private 3D/4D Scans Oatlands, Private Early Pregnancy Scans Oatlands, Private Growth And Presentation Scans Oatlands, 4D Scan Oatlands, 3D Scan Oatlands, Gender Scan Oatlands, Baby Scan Oatlands, Pregnancy Scan Oatlands, Early Pregnancy Scan Oatlands, Private Ultrasound Scan Oatlands, Reassurance Scans Oatlands, Early Viability Scans Oatlands, Dating Scans Oatlands. Private Baby Scans Pollok, Private Baby Ultrasound Scans Pollok, Private Pregnancy Scans Pollok, Private Well Being And Reassurance Scans Pollok, Private Gender/Sexing Scans Pollok, Private 3D/4D Scans Pollok, Private Early Pregnancy Scans Pollok, Private Growth And Presentation Scans Pollok, 4D Scan Pollok, 3D Scan Pollok, Gender Scan Pollok, Baby Scan Pollok, Pregnancy Scan Pollok, Early Pregnancy Scan Pollok, Private Ultrasound Scan Pollok, Reassurance Scans Pollok, Early Viability Scans Pollok, Dating Scans Pollok. Private Baby Scans Pollokshaws, Private Baby Ultrasound Scans Pollokshaws, Private Pregnancy Scans Pollokshaws, Private Well Being And Reassurance Scans Pollokshaws, Private Gender/Sexing Scans Pollokshaws, Private 3D/4D Scans Pollokshaws, Private Early Pregnancy Scans Pollokshaws, Private Growth And Presentation Scans Pollokshaws, 4D Scan Pollokshaws, 3D Scan Pollokshaws, Gender Scan Pollokshaws, Baby Scan Pollokshaws, Pregnancy Scan Pollokshaws, Early Pregnancy Scan Pollokshaws, Private Ultrasound Scan Pollokshaws, Reassurance Scans Pollokshaws, Early Viability Scans Pollokshaws, Dating Scans Pollokshaws. Private Baby Scans Pollokshields, Private Baby Ultrasound Scans Pollokshields, Private Pregnancy Scans Pollokshields, Private Well Being And Reassurance Scans Pollokshields, Private Gender/Sexing Scans Pollokshields, Private 3D/4D Scans Pollokshields, Private Early Pregnancy Scans Pollokshields, Private Growth And Presentation Scans Pollokshields, 4D Scan Pollokshields, 3D Scan Pollokshields, Gender Scan Pollokshields, Baby Scan Pollokshields, Pregnancy Scan Pollokshields, Early Pregnancy Scan Pollokshields, Private Ultrasound Scan Pollokshields, Reassurance Scans Pollokshields, Early Viability Scans Pollokshields, Dating Scans Pollokshields. Private Baby Scans Polmadie, Private Baby Ultrasound Scans Polmadie, Private Pregnancy Scans Polmadie, Private Well Being And Reassurance Scans Polmadie, Private Gender/Sexing Scans Polmadie, Private 3D/4D Scans Polmadie, Private Early Pregnancy Scans Polmadie, Private Growth And Presentation Scans Polmadie, 4D Scan Polmadie, 3D Scan Polmadie, Gender Scan Polmadie, Baby Scan Polmadie, Pregnancy Scan Polmadie, Early Pregnancy Scan Polmadie, Private Ultrasound Scan Polmadie, Reassurance Scans Polmadie, Early Viability Scans Polmadie, Dating Scans Polmadie. Private Baby Scans Priesthill, Private Baby Ultrasound Scans Priesthill, Private Pregnancy Scans Priesthill, Private Well Being And Reassurance Scans Priesthill, Private Gender/Sexing Scans Priesthill, Private 3D/4D Scans Priesthill, Private Early Pregnancy Scans Priesthill, Private Growth And Presentation Scans Priesthill, 4D Scan Priesthill, 3D Scan Priesthill, Gender Scan Priesthill, Baby Scan Priesthill, Pregnancy Scan Priesthill, Early Pregnancy Scan Priesthill, Private Ultrasound Scan Priesthill, Reassurance Scans Priesthill, Early Viability Scans Priesthill, Dating Scans Priesthill. Private Baby Scans Queen’s Park, Private Baby Ultrasound Scans Queen’s Park, Private Pregnancy Scans Queen’s Park, Private Well Being And Reassurance Scans Queen’s Park, Private Gender/Sexing Scans Queen’s Park, Private 3D/4D Scans Queen’s Park, Private Early Pregnancy Scans Queen’s Park, Private Growth And Presentation Scans Queen’s Park, 4D Scan Queen’s Park, 3D Scan Queen’s Park, Gender Scan Queen’s Park, Baby Scan Queen’s Park, Pregnancy Scan Queen’s Park, Early Pregnancy Scan Queen’s Park, Private Ultrasound Scan Queen’s Park, Reassurance Scans Queen’s Park, Early Viability Scans Queen’s Park, Dating Scans Queen’s Park. Private Baby Scans Roughmussel, Private Baby Ultrasound Scans Roughmussel, Private Pregnancy Scans Roughmussel, Private Well Being And Reassurance Scans Roughmussel, Private Gender/Sexing Scans Roughmussel, Private 3D/4D Scans Roughmussel, Private Early Pregnancy Scans Roughmussel, Private Growth And Presentation Scans Roughmussel, 4D Scan Roughmussel, 3D Scan Roughmussel, Gender Scan Roughmussel, Baby Scan Roughmussel, Pregnancy Scan Roughmussel, Early Pregnancy Scan Roughmussel, Private Ultrasound Scan Roughmussel, Reassurance Scans Roughmussel, Early Viability Scans Roughmussel, Dating Scans Roughmussel. Private Baby Scans Shawlands, Private Baby Ultrasound Scans Shawlands, Private Pregnancy Scans Shawlands, Private Well Being And Reassurance Scans Shawlands, Private Gender/Sexing Scans Shawlands, Private 3D/4D Scans Shawlands, Private Early Pregnancy Scans Shawlands, Private Growth And Presentation Scans Shawlands, 4D Scan Shawlands, 3D Scan Shawlands, Gender Scan Shawlands, Baby Scan Shawlands, Pregnancy Scan Shawlands, Early Pregnancy Scan Shawlands, Private Ultrasound Scan Shawlands, Reassurance Scans Shawlands, Early Viability Scans Shawlands, Dating Scans Shawlands. Private Baby Scans Shieldhall, Private Baby Ultrasound Scans Shieldhall, Private Pregnancy Scans Shieldhall, Private Well Being And Reassurance Scans Shieldhall, Private Gender/Sexing Scans Shieldhall, Private 3D/4D Scans Shieldhall, Private Early Pregnancy Scans Shieldhall, Private Growth And Presentation Scans Shieldhall, 4D Scan Shieldhall, 3D Scan Shieldhall, Gender Scan Shieldhall, Baby Scan Shieldhall, Pregnancy Scan Shieldhall, Early Pregnancy Scan Shieldhall, Private Ultrasound Scan Shieldhall, Reassurance Scans Shieldhall, Early Viability Scans Shieldhall, Dating Scans Shieldhall. Private Baby Scans Simshill, Private Baby Ultrasound Scans Simshill, Private Pregnancy Scans Simshill, Private Well Being And Reassurance Scans Simshill, Private Gender/Sexing Scans Simshill, Private 3D/4D Scans Simshill, Private Early Pregnancy Scans Simshill, Private Growth And Presentation Scans Simshill, 4D Scan Simshill, 3D Scan Simshill, Gender Scan Simshill, Baby Scan Simshill, Pregnancy Scan Simshill, Early Pregnancy Scan Simshill, Private Ultrasound Scan Simshill, Reassurance Scans Simshill, Early Viability Scans Simshill, Dating Scans Simshill. Private Baby Scans South Nitshill, Private Baby Ultrasound Scans South Nitshill, Private Pregnancy Scans South Nitshill, Private Well Being And Reassurance Scans South Nitshill, Private Gender/Sexing Scans South Nitshill, Private 3D/4D Scans South Nitshill, Private Early Pregnancy Scans South Nitshill, Private Growth And Presentation Scans South Nitshill, 4D Scan South Nitshill, 3D Scan South Nitshill, Gender Scan South Nitshill, Baby Scan South Nitshill, Pregnancy Scan South Nitshill, Early Pregnancy Scan South Nitshill, Private Ultrasound Scan South Nitshill, Reassurance Scans South Nitshill, Early Viability Scans South Nitshill, Dating Scans South Nitshill. Private Baby Scans Southpark Village, Private Baby Ultrasound Scans Southpark Village, Private Pregnancy Scans Southpark Village, Private Well Being And Reassurance Scans Southpark Village, Private Gender/Sexing Scans Southpark Village, Private 3D/4D Scans Southpark Village, Private Early Pregnancy Scans Southpark Village, Private Growth And Presentation Scans Southpark Village, 4D Scan Southpark Village, 3D Scan Southpark Village, Gender Scan Southpark Village, Baby Scan Southpark Village, Pregnancy Scan Southpark Village, Early Pregnancy Scan Southpark Village, Private Ultrasound Scan Southpark Village, Reassurance Scans Southpark Village, Early Viability Scans Southpark Village, Dating Scans Southpark Village. Private Baby Scans Strathbungo, Private Baby Ultrasound Scans Strathbungo, Private Pregnancy Scans Strathbungo, Private Well Being And Reassurance Scans Strathbungo, Private Gender/Sexing Scans Strathbungo, Private 3D/4D Scans Strathbungo, Private Early Pregnancy Scans Strathbungo, Private Growth And Presentation Scans Strathbungo, 4D Scan Strathbungo, 3D Scan Strathbungo, Gender Scan Strathbungo, Baby Scan Strathbungo, Pregnancy Scan Strathbungo, Early Pregnancy Scan Strathbungo, Private Ultrasound Scan Strathbungo, Reassurance Scans Strathbungo, Early Viability Scans Strathbungo, Dating Scans Strathbungo. Private Baby Scans Toryglen, Private Baby Ultrasound Scans Toryglen, Private Pregnancy Scans Toryglen, Private Well Being And Reassurance Scans Toryglen, Private Gender/Sexing Scans Toryglen, Private 3D/4D Scans Toryglen, Private Early Pregnancy Scans Toryglen, Private Growth And Presentation Scans Toryglen, 4D Scan Toryglen, 3D Scan Toryglen, Gender Scan Toryglen, Baby Scan Toryglen, Pregnancy Scan Toryglen, Early Pregnancy Scan Toryglen, Private Ultrasound Scan Toryglen, Reassurance Scans Toryglen, Early Viability Scans Toryglen, Dating Scans Toryglen. Private Baby Scans Tradeston, Private Baby Ultrasound Scans Tradeston, Private Pregnancy Scans Tradeston, Private Well Being And Reassurance Scans Tradeston, Private Gender/Sexing Scans Tradeston, Private 3D/4D Scans Tradeston, Private Early Pregnancy Scans Tradeston, Private Growth And Presentation Scans Tradeston, 4D Scan Tradeston, 3D Scan Tradeston, Gender Scan Tradeston, Baby Scan Tradeston, Pregnancy Scan Tradeston, Early Pregnancy Scan Tradeston, Private Ultrasound Scan Tradeston, Reassurance Scans Tradeston, Early Viability Scans Tradeston, Dating Scans Tradeston. Private Baby Scans Blantyre, Private Baby Ultrasound Scans Blantyre, Private Pregnancy Scans Blantyre, Private Well Being And Reassurance Scans Blantyre, Private Gender/Sexing Scans Blantyre, Private 3D/4D Scans Blantyre, Private Early Pregnancy Scans Blantyre, Private Growth And Presentation Scans Blantyre, 4D Scan Blantyre, 3D Scan Blantyre, Gender Scan Blantyre, Baby Scan Blantyre, Pregnancy Scan Blantyre, Early Pregnancy Scan Blantyre, Private Ultrasound Scan Blantyre, Reassurance Scans Blantyre, Early Viability Scans Blantyre, Dating Scans Blantyre. Private Baby Scans Cambuslang, Private Baby Ultrasound Scans Cambuslang, Private Pregnancy Scans Cambuslang, Private Well Being And Reassurance Scans Cambuslang, Private Gender/Sexing Scans Cambuslang, Private 3D/4D Scans Cambuslang, Private Early Pregnancy Scans Cambuslang, Private Growth And Presentation Scans Cambuslang, 4D Scan Cambuslang, 3D Scan Cambuslang, Gender Scan Cambuslang, Baby Scan Cambuslang, Pregnancy Scan Cambuslang, Early Pregnancy Scan Cambuslang, Private Ultrasound Scan Cambuslang, Reassurance Scans Cambuslang, Early Viability Scans Cambuslang, Dating Scans Cambuslang. Private Baby Scans Carluke, Private Baby Ultrasound Scans Carluke, Private Pregnancy Scans Carluke, Private Well Being And Reassurance Scans Carluke, Private Gender/Sexing Scans Carluke, Private 3D/4D Scans Carluke, Private Early Pregnancy Scans Carluke, Private Growth And Presentation Scans Carluke, 4D Scan Carluke, 3D Scan Carluke, Gender Scan Carluke, Baby Scan Carluke, Pregnancy Scan Carluke, Early Pregnancy Scan Carluke, Private Ultrasound Scan Carluke, Reassurance Scans Carluke, Early Viability Scans Carluke, Dating Scans Carluke. Private Baby Scans East Kilbride, Private Baby Ultrasound Scans East Kilbride, Private Pregnancy Scans East Kilbride, Private Well Being And Reassurance Scans East Kilbride, Private Gender/Sexing Scans East Kilbride, Private 3D/4D Scans East Kilbride, Private Early Pregnancy Scans East Kilbride, Private Growth And Presentation Scans East Kilbride, 4D Scan East Kilbride, 3D Scan East Kilbride, Gender Scan East Kilbride, Baby Scan East Kilbride, Pregnancy Scan East Kilbride, Early Pregnancy Scan East Kilbride, Private Ultrasound Scan East Kilbride, Reassurance Scans East Kilbride, Early Viability Scans East Kilbride, Dating Scans East Kilbride. Private Baby Scans Hamilton, Private Baby Ultrasound Scans Hamilton, Private Pregnancy Scans Hamilton, Private Well Being And Reassurance Scans Hamilton, Private Gender/Sexing Scans Hamilton, Private 3D/4D Scans Hamilton, Private Early Pregnancy Scans Hamilton, Private Growth And Presentation Scans Hamilton, 4D Scan Hamilton, 3D Scan Hamilton, Gender Scan Hamilton, Baby Scan Hamilton, Pregnancy Scan Hamilton, Early Pregnancy Scan Hamilton, Private Ultrasound Scan Hamilton, Reassurance Scans Hamilton, Early Viability Scans Hamilton, Dating Scans Hamilton. Private Baby Scans Lanark , Private Baby Ultrasound Scans Lanark , Private Pregnancy Scans Lanark , Private Well Being And Reassurance Scans Lanark , Private Gender/Sexing Scans Lanark , Private 3D/4D Scans Lanark , Private Early Pregnancy Scans Lanark , Private Growth And Presentation Scans Lanark , 4D Scan Lanark , 3D Scan Lanark , Gender Scan Lanark , Baby Scan Lanark , Pregnancy Scan Lanark , Early Pregnancy Scan Lanark , Private Ultrasound Scan Lanark , Reassurance Scans Lanark , Early Viability Scans Lanark , Dating Scans Lanark . Private Baby Scans Larkhall , Private Baby Ultrasound Scans Larkhall , Private Pregnancy Scans Larkhall , Private Well Being And Reassurance Scans Larkhall , Private Gender/Sexing Scans Larkhall , Private 3D/4D Scans Larkhall , Private Early Pregnancy Scans Larkhall , Private Growth And Presentation Scans Larkhall , 4D Scan Larkhall , 3D Scan Larkhall , Gender Scan Larkhall , Baby Scan Larkhall , Pregnancy Scan Larkhall , Early Pregnancy Scan Larkhall , Private Ultrasound Scan Larkhall , Reassurance Scans Larkhall , Early Viability Scans Larkhall , Dating Scans Larkhall . Private Baby Scans Rutherglen, Private Baby Ultrasound Scans Rutherglen, Private Pregnancy Scans Rutherglen, Private Well Being And Reassurance Scans Rutherglen, Private Gender/Sexing Scans Rutherglen, Private 3D/4D Scans Rutherglen, Private Early Pregnancy Scans Rutherglen, Private Growth And Presentation Scans Rutherglen, 4D Scan Rutherglen, 3D Scan Rutherglen, Gender Scan Rutherglen, Baby Scan Rutherglen, Pregnancy Scan Rutherglen, Early Pregnancy Scan Rutherglen, Private Ultrasound Scan Rutherglen, Reassurance Scans Rutherglen, Early Viability Scans Rutherglen, Dating Scans Rutherglen Private Baby Scans Strathaven, Private Baby Ultrasound Scans Strathaven, Private Pregnancy Scans Strathaven, Private Well Being And Reassurance Scans Strathaven, Private Gender/Sexing Scans Strathaven, Private 3D/4D Scans Strathaven, Private Early Pregnancy Scans Strathaven, Private Growth And Presentation Scans Strathaven, 4D Scan Strathaven, 3D Scan Strathaven, Gender Scan Strathaven, Baby Scan Strathaven, Pregnancy Scan Strathaven, Early Pregnancy Scan Strathaven, Private Ultrasound Scan Strathaven, Reassurance Scans Strathaven, Early Viability Scans Strathaven, Dating Scans Strathaven Private Baby Scans Abington, Private Baby Ultrasound Scans Abington, Private Pregnancy Scans Abington, Private Well Being And Reassurance Scans Abington, Private Gender/Sexing Scans Abington, Private 3D/4D Scans Abington, Private Early Pregnancy Scans Abington, Private Growth And Presentation Scans Abington, 4D Scan Abington, 3D Scan Abington, Gender Scan Abington, Baby Scan Abington, Pregnancy Scan Abington, Early Pregnancy Scan Abington, Private Ultrasound Scan Abington, Reassurance Scans Abington, Early Viability Scans Abington, Dating Scans Abington Private Baby Scans Ashgill, Private Baby Ultrasound Scans Ashgill, Private Pregnancy Scans Ashgill, Private Well Being And Reassurance Scans Ashgill, Private Gender/Sexing Scans Ashgill, Private 3D/4D Scans Ashgill, Private Early Pregnancy Scans Ashgill, Private Growth And Presentation Scans Ashgill, 4D Scan Ashgill, 3D Scan Ashgill, Gender Scan Ashgill, Baby Scan Ashgill, Pregnancy Scan Ashgill, Early Pregnancy Scan Ashgill, Private Ultrasound Scan Ashgill, Reassurance Scans Ashgill, Early Viability Scans Ashgill, Dating Scans Ashgill. Private Baby Scans Auchengray, Private Baby Ultrasound Scans Auchengray, Private Pregnancy Scans Auchengray, Private Well Being And Reassurance Scans Auchengray, Private Gender/Sexing Scans Auchengray, Private 3D/4D Scans Auchengray, Private Early Pregnancy Scans Auchengray, Private Growth And Presentation Scans Auchengray, 4D Scan Auchengray, 3D Scan Auchengray, Gender Scan Auchengray, Baby Scan Auchengray, Pregnancy Scan Auchengray, Early Pregnancy Scan Auchengray, Private Ultrasound Scan Auchengray, Reassurance Scans Auchengray, Early Viability Scans Auchengray, Dating Scans Auchengray. Private Baby Scans Auchenheath, Private Baby Ultrasound Scans Auchenheath, Private Pregnancy Scans Auchenheath, Private Well Being And Reassurance Scans Auchenheath, Private Gender/Sexing Scans Auchenheath, Private 3D/4D Scans Auchenheath, Private Early Pregnancy Scans Auchenheath, Private Growth And Presentation Scans Auchenheath, 4D Scan Auchenheath, 3D Scan Auchenheath, Gender Scan Auchenheath, Baby Scan Auchenheath, Pregnancy Scan Auchenheath, Early Pregnancy Scan Auchenheath, Private Ultrasound Scan Auchenheath, Reassurance Scans Auchenheath, Early Viability Scans Auchenheath, Dating Scans Auchenheath. Private Baby Scans Auldhouse, Private Baby Ultrasound Scans Auldhouse, Private Pregnancy Scans Auldhouse, Private Well Being And Reassurance Scans Auldhouse, Private Gender/Sexing Scans Auldhouse, Private 3D/4D Scans Auldhouse, Private Early Pregnancy Scans Auldhouse, Private Growth And Presentation Scans Auldhouse, 4D Scan Auldhouse, 3D Scan Auldhouse, Gender Scan Auldhouse, Baby Scan Auldhouse, Pregnancy Scan Auldhouse, Early Pregnancy Scan Auldhouse, Private Ultrasound Scan Auldhouse, Reassurance Scans Auldhouse, Early Viability Scans Auldhouse, Dating Scans Auldhouse Private Baby Scans Biggar, Private Baby Ultrasound Scans Biggar, Private Pregnancy Scans Biggar, Private Well Being And Reassurance Scans Biggar, Private Gender/Sexing Scans Biggar, Private 3D/4D Scans Biggar, Private Early Pregnancy Scans Biggar, Private Growth And Presentation Scans Biggar, 4D Scan Biggar, 3D Scan Biggar, Gender Scan Biggar, Baby Scan Biggar, Pregnancy Scan Biggar, Early Pregnancy Scan Biggar, Private Ultrasound Scan Biggar, Reassurance Scans Biggar, Early Viability Scans Biggar, Dating Scans Biggar. Private Baby Scans Blackwood, Private Baby Ultrasound Scans Blackwood, Private Pregnancy Scans Blackwood, Private Well Being And Reassurance Scans Blackwood, Private Gender/Sexing Scans Blackwood, Private 3D/4D Scans Blackwood, Private Early Pregnancy Scans Blackwood, Private Growth And Presentation Scans Blackwood, 4D Scan Blackwood, 3D Scan Blackwood, Gender Scan Blackwood, Baby Scan Blackwood, Pregnancy Scan Blackwood, Early Pregnancy Scan Blackwood, Private Ultrasound Scan Blackwood, Reassurance Scans Blackwood, Early Viability Scans Blackwood, Dating Scans Blackwood. Private Baby Scans Bothwell, Private Baby Ultrasound Scans Bothwell, Private Pregnancy Scans Bothwell, Private Well Being And Reassurance Scans Bothwell, Private Gender/Sexing Scans Bothwell, Private 3D/4D Scans Bothwell, Private Early Pregnancy Scans Bothwell, Private Growth And Presentation Scans Bothwell, 4D Scan Bothwell, 3D Scan Bothwell, Gender Scan Bothwell, Baby Scan Bothwell, Pregnancy Scan Bothwell, Early Pregnancy Scan Bothwell, Private Ultrasound Scan Bothwell, Reassurance Scans Bothwell, Early Viability Scans Bothwell, Dating Scans Bothwell. Private Baby Scans Braehead, Private Baby Ultrasound Scans Braehead, Private Pregnancy Scans Braehead, Private Well Being And Reassurance Scans Braehead, Private Gender/Sexing Scans Braehead, Private 3D/4D Scans Braehead, Private Early Pregnancy Scans Braehead, Private Growth And Presentation Scans Braehead, 4D Scan Braehead, 3D Scan Braehead, Gender Scan Braehead, Baby Scan Braehead, Pregnancy Scan Braehead, Early Pregnancy Scan Braehead, Private Ultrasound Scan Braehead, Reassurance Scans Braehead, Early Viability Scans Braehead, Dating Scans Braehead. Private Baby Scans Braidwood, Private Baby Ultrasound Scans Braidwood, Private Pregnancy Scans Braidwood, Private Well Being And Reassurance Scans Braidwood, Private Gender/Sexing Scans Braidwood, Private 3D/4D Scans Braidwood, Private Early Pregnancy Scans Braidwood, Private Growth And Presentation Scans Braidwood, 4D Scan Braidwood, 3D Scan Braidwood, Gender Scan Braidwood, Baby Scan Braidwood, Pregnancy Scan Braidwood, Early Pregnancy Scan Braidwood, Private Ultrasound Scan Braidwood, Reassurance Scans Braidwood, Early Viability Scans Braidwood, Dating Scans Braidwood. Private Baby Scans Carmichael, Private Baby Ultrasound Scans Carmichael, Private Pregnancy Scans Carmichael, Private Well Being And Reassurance Scans Carmichael, Private Gender/Sexing Scans Carmichael, Private 3D/4D Scans Carmichael, Private Early Pregnancy Scans Carmichael, Private Growth And Presentation Scans Carmichael, 4D Scan Carmichael, 3D Scan Carmichael, Gender Scan Carmichael, Baby Scan Carmichael, Pregnancy Scan Carmichael, Early Pregnancy Scan Carmichael, Private Ultrasound Scan Carmichael, Reassurance Scans Carmichael, Early Viability Scans Carmichael, Dating Scans Carmichael. Private Baby Scans Carnwath , Private Baby Ultrasound Scans Carnwath , Private Pregnancy Scans Carnwath , Private Well Being And Reassurance Scans Carnwath , Private Gender/Sexing Scans Carnwath , Private 3D/4D Scans Carnwath , Private Early Pregnancy Scans Carnwath , Private Growth And Presentation Scans Carnwath , 4D Scan Carnwath , 3D Scan Carnwath , Gender Scan Carnwath , Baby Scan Carnwath , Pregnancy Scan Carnwath , Early Pregnancy Scan Carnwath , Private Ultrasound Scan Carnwath , Reassurance Scans Carnwath , Early Viability Scans Carnwath , Dating Scans Carnwath . Private Baby Scans Carstairs, Private Baby Ultrasound Scans Carstairs, Private Pregnancy Scans Carstairs, Private Well Being And Reassurance Scans Carstairs, Private Gender/Sexing Scans Carstairs, Private 3D/4D Scans Carstairs, Private Early Pregnancy Scans Carstairs, Private Growth And Presentation Scans Carstairs, 4D Scan Carstairs, 3D Scan Carstairs, Gender Scan Carstairs, Baby Scan Carstairs, Pregnancy Scan Carstairs, Early Pregnancy Scan Carstairs, Private Ultrasound Scan Carstairs, Reassurance Scans Carstairs, Early Viability Scans Carstairs, Dating Scans Carstairs. Private Baby Scans Chapelton, Private Baby Ultrasound Scans Chapelton, Private Pregnancy Scans Chapelton, Private Well Being And Reassurance Scans Chapelton, Private Gender/Sexing Scans Chapelton, Private 3D/4D Scans Chapelton, Private Early Pregnancy Scans Chapelton, Private Growth And Presentation Scans Chapelton, 4D Scan Chapelton, 3D Scan Chapelton, Gender Scan Chapelton, Baby Scan Chapelton, Pregnancy Scan Chapelton, Early Pregnancy Scan Chapelton, Private Ultrasound Scan Chapelton, Reassurance Scans Chapelton, Early Viability Scans Chapelton, Dating Scans Chapelton. Private Baby Scans Cleghorn, Private Baby Ultrasound Scans Cleghorn, Private Pregnancy Scans Cleghorn, Private Well Being And Reassurance Scans Cleghorn, Private Gender/Sexing Scans Cleghorn, Private 3D/4D Scans Cleghorn, Private Early Pregnancy Scans Cleghorn, Private Growth And Presentation Scans Cleghorn, 4D Scan Cleghorn, 3D Scan Cleghorn, Gender Scan Cleghorn, Baby Scan Cleghorn, Pregnancy Scan Cleghorn, Early Pregnancy Scan Cleghorn, Private Ultrasound Scan Cleghorn, Reassurance Scans Cleghorn, Early Viability Scans Cleghorn, Dating Scans Cleghorn. Private Baby Scans Climpy, Private Baby Ultrasound Scans Climpy, Private Pregnancy Scans Climpy, Private Well Being And Reassurance Scans Climpy, Private Gender/Sexing Scans Climpy, Private 3D/4D Scans Climpy, Private Early Pregnancy Scans Climpy, Private Growth And Presentation Scans Climpy, 4D Scan Climpy, 3D Scan Climpy, Gender Scan Climpy, Baby Scan Climpy, Pregnancy Scan Climpy, Early Pregnancy Scan Climpy, Private Ultrasound Scan Climpy, Reassurance Scans Climpy, Early Viability Scans Climpy, Dating Scans Climpy. Private Baby Scans Coalburn, Private Baby Ultrasound Scans Coalburn, Private Pregnancy Scans Coalburn, Private Well Being And Reassurance Scans Coalburn, Private Gender/Sexing Scans Coalburn, Private 3D/4D Scans Coalburn, Private Early Pregnancy Scans Coalburn, Private Growth And Presentation Scans Coalburn, 4D Scan Coalburn, 3D Scan Coalburn, Gender Scan Coalburn, Baby Scan Coalburn, Pregnancy Scan Coalburn, Early Pregnancy Scan Coalburn, Private Ultrasound Scan Coalburn, Reassurance Scans Coalburn, Early Viability Scans Coalburn, Dating Scans Coalburn. Private Baby Scans Cobbinshaw, Private Baby Ultrasound Scans Cobbinshaw, Private Pregnancy Scans Cobbinshaw, Private Well Being And Reassurance Scans Cobbinshaw, Private Gender/Sexing Scans Cobbinshaw, Private 3D/4D Scans Cobbinshaw, Private Early Pregnancy Scans Cobbinshaw, Private Growth And Presentation Scans Cobbinshaw, 4D Scan Cobbinshaw, 3D Scan Cobbinshaw, Gender Scan Cobbinshaw, Baby Scan Cobbinshaw, Pregnancy Scan Cobbinshaw, Early Pregnancy Scan Cobbinshaw, Private Ultrasound Scan Cobbinshaw, Reassurance Scans Cobbinshaw, Early Viability Scans Cobbinshaw, Dating Scans Cobbinshaw. Private Baby Scans Coulter, Private Baby Ultrasound Scans Coulter, Private Pregnancy Scans Coulter, Private Well Being And Reassurance Scans Coulter, Private Gender/Sexing Scans Coulter, Private 3D/4D Scans Coulter, Private Early Pregnancy Scans Coulter, Private Growth And Presentation Scans Coulter, 4D Scan Coulter, 3D Scan Coulter, Gender Scan Coulter, Baby Scan Coulter, Pregnancy Scan Coulter, Early Pregnancy Scan Coulter, Private Ultrasound Scan Coulter, Reassurance Scans Coulter, Early Viability Scans Coulter, Dating Scans Coulter. Private Baby Scans Crawford, Private Baby Ultrasound Scans Crawford, Private Pregnancy Scans Crawford, Private Well Being And Reassurance Scans Crawford, Private Gender/Sexing Scans Crawford, Private 3D/4D Scans Crawford, Private Early Pregnancy Scans Crawford, Private Growth And Presentation Scans Crawford, 4D Scan Crawford, 3D Scan Crawford, Gender Scan Crawford, Baby Scan Crawford, Pregnancy Scan Crawford, Early Pregnancy Scan Crawford, Private Ultrasound Scan Crawford, Reassurance Scans Crawford, Early Viability Scans Crawford, Dating Scans Crawford. Private Baby Scans Crawfordjohn, Private Baby Ultrasound Scans Crawfordjohn, Private Pregnancy Scans Crawfordjohn, Private Well Being And Reassurance Scans Crawfordjohn, Private Gender/Sexing Scans Crawfordjohn, Private 3D/4D Scans Crawfordjohn, Private Early Pregnancy Scans Crawfordjohn, Private Growth And Presentation Scans Crawfordjohn, 4D Scan Crawfordjohn, 3D Scan Crawfordjohn, Gender Scan Crawfordjohn, Baby Scan Crawfordjohn, Pregnancy Scan Crawfordjohn, Early Pregnancy Scan Crawfordjohn, Private Ultrasound Scan Crawfordjohn, Reassurance Scans Crawfordjohn, Early Viability Scans Crawfordjohn, Dating Scans Crawfordjohn. Private Baby Scans Crossford, Private Baby Ultrasound Scans Crossford, Private Pregnancy Scans Crossford, Private Well Being And Reassurance Scans Crossford, Private Gender/Sexing Scans Crossford, Private 3D/4D Scans Crossford, Private Early Pregnancy Scans Crossford, Private Growth And Presentation Scans Crossford, 4D Scan Crossford, 3D Scan Crossford, Gender Scan Crossford, Baby Scan Crossford, Pregnancy Scan Crossford, Early Pregnancy Scan Crossford, Private Ultrasound Scan Crossford, Reassurance Scans Crossford, Early Viability Scans Crossford, Dating Scans Crossford. Private Baby Scans Dalserf, Private Baby Ultrasound Scans Dalserf, Private Pregnancy Scans Dalserf, Private Well Being And Reassurance Scans Dalserf, Private Gender/Sexing Scans Dalserf, Private 3D/4D Scans Dalserf, Private Early Pregnancy Scans Dalserf, Private Growth And Presentation Scans Dalserf, 4D Scan Dalserf, 3D Scan Dalserf, Gender Scan Dalserf, Baby Scan Dalserf, Pregnancy Scan Dalserf, Early Pregnancy Scan Dalserf, Private Ultrasound Scan Dalserf, Reassurance Scans Dalserf, Early Viability Scans Dalserf, Dating Scans Dalserf. Private Baby Scans Dolphinton, Private Baby Ultrasound Scans Dolphinton, Private Pregnancy Scans Dolphinton, Private Well Being And Reassurance Scans Dolphinton, Private Gender/Sexing Scans Dolphinton, Private 3D/4D Scans Dolphinton, Private Early Pregnancy Scans Dolphinton, Private Growth And Presentation Scans Dolphinton, 4D Scan Dolphinton, 3D Scan Dolphinton, Gender Scan Dolphinton, Baby Scan Dolphinton, Pregnancy Scan Dolphinton, Early Pregnancy Scan Dolphinton, Private Ultrasound Scan Dolphinton, Reassurance Scans Dolphinton, Early Viability Scans Dolphinton, Dating Scans Dolphinton. Private Baby Scans Douglas, Private Baby Ultrasound Scans Douglas, Private Pregnancy Scans Douglas, Private Well Being And Reassurance Scans Douglas, Private Gender/Sexing Scans Douglas, Private 3D/4D Scans Douglas, Private Early Pregnancy Scans Douglas, Private Growth And Presentation Scans Douglas, 4D Scan Douglas, 3D Scan Douglas, Gender Scan Douglas, Baby Scan Douglas, Pregnancy Scan Douglas, Early Pregnancy Scan Douglas, Private Ultrasound Scan Douglas, Reassurance Scans Douglas, Early Viability Scans Douglas, Dating Scans Douglas. Private Baby Scans Douglas Water, Private Baby Ultrasound Scans Douglas Water, Private Pregnancy Scans Douglas Water, Private Well Being And Reassurance Scans Douglas Water, Private Gender/Sexing Scans Douglas Water, Private 3D/4D Scans Douglas Water, Private Early Pregnancy Scans Douglas Water, Private Growth And Presentation Scans Douglas Water, 4D Scan Douglas Water, 3D Scan Douglas Water, Gender Scan Douglas Water, Baby Scan Douglas Water, Pregnancy Scan Douglas Water, Early Pregnancy Scan Douglas Water, Private Ultrasound Scan Douglas Water, Reassurance Scans Douglas Water, Early Viability Scans Douglas Water, Dating Scans Douglas Water. Private Baby Scans Elsrickle, Private Baby Ultrasound Scans Elsrickle, Private Pregnancy Scans Elsrickle, Private Well Being And Reassurance Scans Elsrickle, Private Gender/Sexing Scans Elsrickle, Private 3D/4D Scans Elsrickle, Private Early Pregnancy Scans Elsrickle, Private Growth And Presentation Scans Elsrickle, 4D Scan Elsrickle, 3D Scan Elsrickle, Gender Scan Elsrickle, Baby Scan Elsrickle, Pregnancy Scan Elsrickle, Early Pregnancy Scan Elsrickle, Private Ultrasound Scan Elsrickle, Reassurance Scans Elsrickle, Early Viability Scans Elsrickle, Dating Scans Elsrickle. Private Baby Scans Elvanfoot, Private Baby Ultrasound Scans Elvanfoot, Private Pregnancy Scans Elvanfoot, Private Well Being And Reassurance Scans Elvanfoot, Private Gender/Sexing Scans Elvanfoot, Private 3D/4D Scans Elvanfoot, Private Early Pregnancy Scans Elvanfoot, Private Growth And Presentation Scans Elvanfoot, 4D Scan Elvanfoot, 3D Scan Elvanfoot, Gender Scan Elvanfoot, Baby Scan Elvanfoot, Pregnancy Scan Elvanfoot, Early Pregnancy Scan Elvanfoot, Private Ultrasound Scan Elvanfoot, Reassurance Scans Elvanfoot, Early Viability Scans Elvanfoot, Dating Scans Elvanfoot. Private Baby Scans Forth, Private Baby Ultrasound Scans Forth, Private Pregnancy Scans Forth, Private Well Being And Reassurance Scans Forth, Private Gender/Sexing Scans Forth, Private 3D/4D Scans Forth, Private Early Pregnancy Scans Forth, Private Growth And Presentation Scans Forth, 4D Scan Forth, 3D Scan Forth, Gender Scan Forth, Baby Scan Forth, Pregnancy Scan Forth, Early Pregnancy Scan Forth, Private Ultrasound Scan Forth, Reassurance Scans Forth, Early Viability Scans Forth, Dating Scans Forth. Private Baby Scans Glassford, Private Baby Ultrasound Scans Glassford, Private Pregnancy Scans Glassford, Private Well Being And Reassurance Scans Glassford, Private Gender/Sexing Scans Glassford, Private 3D/4D Scans Glassford, Private Early Pregnancy Scans Glassford, Private Growth And Presentation Scans Glassford, 4D Scan Glassford, 3D Scan Glassford, Gender Scan Glassford, Baby Scan Glassford, Pregnancy Scan Glassford, Early Pregnancy Scan Glassford, Private Ultrasound Scan Glassford, Reassurance Scans Glassford, Early Viability Scans Glassford, Dating Scans Glassford. Private Baby Scans Glespin, Private Baby Ultrasound Scans Glespin, Private Pregnancy Scans Glespin, Private Well Being And Reassurance Scans Glespin, Private Gender/Sexing Scans Glespin, Private 3D/4D Scans Glespin, Private Early Pregnancy Scans Glespin, Private Growth And Presentation Scans Glespin, 4D Scan Glespin, 3D Scan Glespin, Gender Scan Glespin, Baby Scan Glespin, Pregnancy Scan Glespin, Early Pregnancy Scan Glespin, Private Ultrasound Scan Glespin, Reassurance Scans Glespin, Early Viability Scans Glespin, Dating Scans Glespin. Private Baby Scans Jackton, Private Baby Ultrasound Scans Jackton, Private Pregnancy Scans Jackton, Private Well Being And Reassurance Scans Jackton, Private Gender/Sexing Scans Jackton, Private 3D/4D Scans Jackton, Private Early Pregnancy Scans Jackton, Private Growth And Presentation Scans Jackton, 4D Scan Jackton, 3D Scan Jackton, Gender Scan Jackton, Baby Scan Jackton, Pregnancy Scan Jackton, Early Pregnancy Scan Jackton, Private Ultrasound Scan Jackton, Reassurance Scans Jackton, Early Viability Scans Jackton, Dating Scans Jackton. Private Baby Scans Kilncadzow, Private Baby Ultrasound Scans Kilncadzow, Private Pregnancy Scans Kilncadzow, Private Well Being And Reassurance Scans Kilncadzow, Private Gender/Sexing Scans Kilncadzow, Private 3D/4D Scans Kilncadzow, Private Early Pregnancy Scans Kilncadzow, Private Growth And Presentation Scans Kilncadzow, 4D Scan Kilncadzow, 3D Scan Kilncadzow, Gender Scan Kilncadzow, Baby Scan Kilncadzow, Pregnancy Scan Kilncadzow, Early Pregnancy Scan Kilncadzow, Private Ultrasound Scan Kilncadzow, Reassurance Scans Kilncadzow, Early Viability Scans Kilncadzow, Dating Scans Kilncadzow. Private Baby Scans Kirkfieldbank, Private Baby Ultrasound Scans Kirkfieldbank, Private Pregnancy Scans Kirkfieldbank, Private Well Being And Reassurance Scans Kirkfieldbank, Private Gender/Sexing Scans Kirkfieldbank, Private 3D/4D Scans Kirkfieldbank, Private Early Pregnancy Scans Kirkfieldbank, Private Growth And Presentation Scans Kirkfieldbank, 4D Scan Kirkfieldbank, 3D Scan Kirkfieldbank, Gender Scan Kirkfieldbank, Baby Scan Kirkfieldbank, Pregnancy Scan Kirkfieldbank, Early Pregnancy Scan Kirkfieldbank, Private Ultrasound Scan Kirkfieldbank, Reassurance Scans Kirkfieldbank, Early Viability Scans Kirkfieldbank, Dating Scans Kirkfieldbank. Private Baby Scans Kirkmuirhill, Private Baby Ultrasound Scans Kirkmuirhill, Private Pregnancy Scans Kirkmuirhill, Private Well Being And Reassurance Scans Kirkmuirhill, Private Gender/Sexing Scans Kirkmuirhill, Private 3D/4D Scans Kirkmuirhill, Private Early Pregnancy Scans Kirkmuirhill, Private Growth And Presentation Scans Kirkmuirhill, 4D Scan Kirkmuirhill, 3D Scan Kirkmuirhill, Gender Scan Kirkmuirhill, Baby Scan Kirkmuirhill, Pregnancy Scan Kirkmuirhill, Early Pregnancy Scan Kirkmuirhill, Private Ultrasound Scan Kirkmuirhill, Reassurance Scans Kirkmuirhill, Early Viability Scans Kirkmuirhill, Dating Scans Kirkmuirhill. Private Baby Scans Law Village, Private Baby Ultrasound Scans Law Village, Private Pregnancy Scans Law Village, Private Well Being And Reassurance Scans Law Village, Private Gender/Sexing Scans Law Village, Private 3D/4D Scans Law Village, Private Early Pregnancy Scans Law Village, Private Growth And Presentation Scans Law Village, 4D Scan Law Village, 3D Scan Law Village, Gender Scan Law Village, Baby Scan Law Village, Pregnancy Scan Law Village, Early Pregnancy Scan Law Village, Private Ultrasound Scan Law Village, Reassurance Scans Law Village, Early Viability Scans Law Village, Dating Scans Law Village. Private Baby Scans Leadhills, Private Baby Ultrasound Scans Leadhills, Private Pregnancy Scans Leadhills, Private Well Being And Reassurance Scans Leadhills, Private Gender/Sexing Scans Leadhills, Private 3D/4D Scans Leadhills, Private Early Pregnancy Scans Leadhills, Private Growth And Presentation Scans Leadhills, 4D Scan Leadhills, 3D Scan Leadhills, Gender Scan Leadhills, Baby Scan Leadhills, Pregnancy Scan Leadhills, Early Pregnancy Scan Leadhills, Private Ultrasound Scan Leadhills, Reassurance Scans Leadhills, Early Viability Scans Leadhills, Dating Scans Leadhills. Private Baby Scans Lesmahagow, Private Baby Ultrasound Scans Lesmahagow, Private Pregnancy Scans Lesmahagow, Private Well Being And Reassurance Scans Lesmahagow, Private Gender/Sexing Scans Lesmahagow, Private 3D/4D Scans Lesmahagow, Private Early Pregnancy Scans Lesmahagow, Private Growth And Presentation Scans Lesmahagow, 4D Scan Lesmahagow, 3D Scan Lesmahagow, Gender Scan Lesmahagow, Baby Scan Lesmahagow, Pregnancy Scan Lesmahagow, Early Pregnancy Scan Lesmahagow, Private Ultrasound Scan Lesmahagow, Reassurance Scans Lesmahagow, Early Viability Scans Lesmahagow, Dating Scans Lesmahagow. Private Baby Scans Newbigging , Private Baby Ultrasound Scans Newbigging , Private Pregnancy Scans Newbigging , Private Well Being And Reassurance Scans Newbigging , Private Gender/Sexing Scans Newbigging , Private 3D/4D Scans Newbigging , Private Early Pregnancy Scans Newbigging , Private Growth And Presentation Scans Newbigging , 4D Scan Newbigging , 3D Scan Newbigging , Gender Scan Newbigging , Baby Scan Newbigging , Pregnancy Scan Newbigging , Early Pregnancy Scan Newbigging , Private Ultrasound Scan Newbigging , Reassurance Scans Newbigging , Early Viability Scans Newbigging , Dating Scans Newbigging . Private Baby Scans Nerston, Private Baby Ultrasound Scans Nerston, Private Pregnancy Scans Nerston, Private Well Being And Reassurance Scans Nerston, Private Gender/Sexing Scans Nerston, Private 3D/4D Scans Nerston, Private Early Pregnancy Scans Nerston, Private Growth And Presentation Scans Nerston, 4D Scan Nerston, 3D Scan Nerston, Gender Scan Nerston, Baby Scan Nerston, Pregnancy Scan Nerston, Early Pregnancy Scan Nerston, Private Ultrasound Scan Nerston, Reassurance Scans Nerston, Early Viability Scans Nerston, Dating Scans Nerston. Private Baby Scans Pettinain, Private Baby Ultrasound Scans Pettinain, Private Pregnancy Scans Pettinain, Private Well Being And Reassurance Scans Pettinain, Private Gender/Sexing Scans Pettinain, Private 3D/4D Scans Pettinain, Private Early Pregnancy Scans Pettinain, Private Growth And Presentation Scans Pettinain, 4D Scan Pettinain, 3D Scan Pettinain, Gender Scan Pettinain, Baby Scan Pettinain, Pregnancy Scan Pettinain, Early Pregnancy Scan Pettinain, Private Ultrasound Scan Pettinain, Reassurance Scans Pettinain, Early Viability Scans Pettinain, Dating Scans Pettinain. Private Baby Scans Quothquan, Private Baby Ultrasound Scans Quothquan, Private Pregnancy Scans Quothquan, Private Well Being And Reassurance Scans Quothquan, Private Gender/Sexing Scans Quothquan, Private 3D/4D Scans Quothquan, Private Early Pregnancy Scans Quothquan, Private Growth And Presentation Scans Quothquan, 4D Scan Quothquan, 3D Scan Quothquan, Gender Scan Quothquan, Baby Scan Quothquan, Pregnancy Scan Quothquan, Early Pregnancy Scan Quothquan, Private Ultrasound Scan Quothquan, Reassurance Scans Quothquan, Early Viability Scans Quothquan, Dating Scans Quothquan Private Baby Scans Rigside, Private Baby Ultrasound Scans Rigside, Private Pregnancy Scans Rigside, Private Well Being And Reassurance Scans Rigside, Private Gender/Sexing Scans Rigside, Private 3D/4D Scans Rigside, Private Early Pregnancy Scans Rigside, Private Growth And Presentation Scans Rigside, 4D Scan Rigside, 3D Scan Rigside, Gender Scan Rigside, Baby Scan Rigside, Pregnancy Scan Rigside, Early Pregnancy Scan Rigside, Private Ultrasound Scan Rigside, Reassurance Scans Rigside, Early Viability Scans Rigside, Dating Scans Rigside. Private Baby Scans Rosebank , Private Baby Ultrasound Scans Rosebank , Private Pregnancy Scans Rosebank , Private Well Being And Reassurance Scans Rosebank , Private Gender/Sexing Scans Rosebank , Private 3D/4D Scans Rosebank , Private Early Pregnancy Scans Rosebank , Private Growth And Presentation Scans Rosebank , 4D Scan Rosebank , 3D Scan Rosebank , Gender Scan Rosebank , Baby Scan Rosebank , Pregnancy Scan Rosebank , Early Pregnancy Scan Rosebank , Private Ultrasound Scan Rosebank , Reassurance Scans Rosebank , Early Viability Scans Rosebank , Dating Scans Rosebank . Private Baby Scans Sandford, Private Baby Ultrasound Scans Sandford, Private Pregnancy Scans Sandford, Private Well Being And Reassurance Scans Sandford, Private Gender/Sexing Scans Sandford, Private 3D/4D Scans Sandford, Private Early Pregnancy Scans Sandford, Private Growth And Presentation Scans Sandford, 4D Scan Sandford, 3D Scan Sandford, Gender Scan Sandford, Baby Scan Sandford, Pregnancy Scan Sandford, Early Pregnancy Scan Sandford, Private Ultrasound Scan Sandford, Reassurance Scans Sandford, Early Viability Scans Sandford, Dating Scans Sandford. Private Baby Scans Stonehouse, Private Baby Ultrasound Scans Stonehouse, Private Pregnancy Scans Stonehouse, Private Well Being And Reassurance Scans Stonehouse, Private Gender/Sexing Scans Stonehouse, Private 3D/4D Scans Stonehouse, Private Early Pregnancy Scans Stonehouse, Private Growth And Presentation Scans Stonehouse, 4D Scan Stonehouse, 3D Scan Stonehouse, Gender Scan Stonehouse, Baby Scan Stonehouse, Pregnancy Scan Stonehouse, Early Pregnancy Scan Stonehouse, Private Ultrasound Scan Stonehouse, Reassurance Scans Stonehouse, Early Viability Scans Stonehouse, Dating Scans Stonehouse. Private Baby Scans Symington, Private Baby Ultrasound Scans Symington, Private Pregnancy Scans Symington, Private Well Being And Reassurance Scans Symington, Private Gender/Sexing Scans Symington, Private 3D/4D Scans Symington, Private Early Pregnancy Scans Symington, Private Growth And Presentation Scans Symington, 4D Scan Symington, 3D Scan Symington, Gender Scan Symington, Baby Scan Symington, Pregnancy Scan Symington, Early Pregnancy Scan Symington, Private Ultrasound Scan Symington, Reassurance Scans Symington, Early Viability Scans Symington, Dating Scans Symington. Private Baby Scans Tarbrax , Private Baby Ultrasound Scans Tarbrax , Private Pregnancy Scans Tarbrax , Private Well Being And Reassurance Scans Tarbrax , Private Gender/Sexing Scans Tarbrax , Private 3D/4D Scans Tarbrax , Private Early Pregnancy Scans Tarbrax , Private Growth And Presentation Scans Tarbrax , 4D Scan Tarbrax , 3D Scan Tarbrax , Gender Scan Tarbrax , Baby Scan Tarbrax , Pregnancy Scan Tarbrax , Early Pregnancy Scan Tarbrax , Private Ultrasound Scan Tarbrax , Reassurance Scans Tarbrax , Early Viability Scans Tarbrax , Dating Scans Tarbrax . Private Baby Scans Thankerton, Private Baby Ultrasound Scans Thankerton, Private Pregnancy Scans Thankerton, Private Well Being And Reassurance Scans Thankerton, Private Gender/Sexing Scans Thankerton, Private 3D/4D Scans Thankerton, Private Early Pregnancy Scans Thankerton, Private Growth And Presentation Scans Thankerton, 4D Scan Thankerton, 3D Scan Thankerton, Gender Scan Thankerton, Baby Scan Thankerton, Pregnancy Scan Thankerton, Early Pregnancy Scan Thankerton, Private Ultrasound Scan Thankerton, Reassurance Scans Thankerton, Early Viability Scans Thankerton, Dating Scans Thankerton. Private Baby Scans Thorntonhall, Private Baby Ultrasound Scans Thorntonhall, Private Pregnancy Scans Thorntonhall, Private Well Being And Reassurance Scans Thorntonhall, Private Gender/Sexing Scans Thorntonhall, Private 3D/4D Scans Thorntonhall, Private Early Pregnancy Scans Thorntonhall, Private Growth And Presentation Scans Thorntonhall, 4D Scan Thorntonhall, 3D Scan Thorntonhall, Gender Scan Thorntonhall, Baby Scan Thorntonhall, Pregnancy Scan Thorntonhall, Early Pregnancy Scan Thorntonhall, Private Ultrasound Scan Thorntonhall, Reassurance Scans Thorntonhall, Early Viability Scans Thorntonhall, Dating Scans Thorntonhall. Private Baby Scans Uddingston, Private Baby Ultrasound Scans Uddingston, Private Pregnancy Scans Uddingston, Private Well Being And Reassurance Scans Uddingston, Private Gender/Sexing Scans Uddingston, Private 3D/4D Scans Uddingston, Private Early Pregnancy Scans Uddingston, Private Growth And Presentation Scans Uddingston, 4D Scan Uddingston, 3D Scan Uddingston, Gender Scan Uddingston, Baby Scan Uddingston, Pregnancy Scan Uddingston, Early Pregnancy Scan Uddingston, Private Ultrasound Scan Uddingston, Reassurance Scans Uddingston, Early Viability Scans Uddingston, Dating Scans Uddingston. Private Baby Scans Unthank, Private Baby Ultrasound Scans Unthank, Private Pregnancy Scans Unthank, Private Well Being And Reassurance Scans Unthank, Private Gender/Sexing Scans Unthank, Private 3D/4D Scans Unthank, Private Early Pregnancy Scans Unthank, Private Growth And Presentation Scans Unthank, 4D Scan Unthank, 3D Scan Unthank, Gender Scan Unthank, Baby Scan Unthank, Pregnancy Scan Unthank, Early Pregnancy Scan Unthank, Private Ultrasound Scan Unthank, Reassurance Scans Unthank, Early Viability Scans Unthank, Dating Scans Unthank. Private Baby Scans Waterfoot, Private Baby Ultrasound Scans Waterfoot, Private Pregnancy Scans Waterfoot, Private Well Being And Reassurance Scans Waterfoot, Private Gender/Sexing Scans Waterfoot, Private 3D/4D Scans Waterfoot, Private Early Pregnancy Scans Waterfoot, Private Growth And Presentation Scans Waterfoot, 4D Scan Waterfoot, 3D Scan Waterfoot, Gender Scan Waterfoot, Baby Scan Waterfoot, Pregnancy Scan Waterfoot, Early Pregnancy Scan Waterfoot, Private Ultrasound Scan Waterfoot, Reassurance Scans Waterfoot, Early Viability Scans Waterfoot, Dating Scans Waterfoot. Private Baby Scans Wilsontown, Private Baby Ultrasound Scans Wilsontown, Private Pregnancy Scans Wilsontown, Private Well Being And Reassurance Scans Wilsontown, Private Gender/Sexing Scans Wilsontown, Private 3D/4D Scans Wilsontown, Private Early Pregnancy Scans Wilsontown, Private Growth And Presentation Scans Wilsontown, 4D Scan Wilsontown, 3D Scan Wilsontown, Gender Scan Wilsontown, Baby Scan Wilsontown, Pregnancy Scan Wilsontown, Early Pregnancy Scan Wilsontown, Private Ultrasound Scan Wilsontown, Reassurance Scans Wilsontown, Early Viability Scans Wilsontown, Dating Scans Wilsontown. Private Baby Scans Wiston, Private Baby Ultrasound Scans Wiston, Private Pregnancy Scans Wiston, Private Well Being And Reassurance Scans Wiston, Private Gender/Sexing Scans Wiston, Private 3D/4D Scans Wiston, Private Early Pregnancy Scans Wiston, Private Growth And Presentation Scans Wiston, 4D Scan Wiston, 3D Scan Wiston, Gender Scan Wiston, Baby Scan Wiston, Pregnancy Scan Wiston, Early Pregnancy Scan Wiston, Private Ultrasound Scan Wiston, Reassurance Scans Wiston, Early Viability Scans Wiston, Dating Scans Wiston. Private Baby Scans Woolfords, Private Baby Ultrasound Scans Woolfords, Private Pregnancy Scans Woolfords, Private Well Being And Reassurance Scans Woolfords, Private Gender/Sexing Scans Woolfords, Private 3D/4D Scans Woolfords, Private Early Pregnancy Scans Woolfords, Private Growth And Presentation Scans Woolfords, 4D Scan Woolfords, 3D Scan Woolfords, Gender Scan Woolfords, Baby Scan Woolfords, Pregnancy Scan Woolfords, Early Pregnancy Scan Woolfords, Private Ultrasound Scan Woolfords, Reassurance Scans Woolfords, Early Viability Scans Woolfords, Dating Scans Woolfords. 4D baby scan Hamilton, 4D Baby Scan Glasgow, Gender Scan Hamilton, Gender Scan Glasgow, 4D baby scan wiston, gender scan wiston, 4d baby scan stonehouse, gender scan stonehouse, 4d baby scan sandford, gender scan sandford. 4d baby scan rigside, gender scan rigside. window to the womb hamilton, window to the womb glasgow. baby gender scan hamilton. baby gender scan glasgow. Early baby scan Hamilton, early scan Hamilton, early pregnancy scan Hamilton, dating scan Hamilton, reassurance scan Hamilton. Viability scan Hamilton, specialist scan Hamilton, private baby scan Hamilton, early pregnancy ultrasound Hamilton, private pregnancy scan Hamilton, internal scan Hamilton, previous ectopic scan Hamilton, previous miscarriage scan Hamilton, pregnancy symptoms scan Hamilton, 6 week scan Hamilton, 7 week scan Hamilton, 8 week scan Hamilton, 9 week scan Hamilton, 10 week scan Hamilton, 11 week scan Hamilton, 12 week scan Hamilton, Early baby scan Glasgow, early scan Glasgow, early pregnancy scan Glasgow, dating scan Glasgow, reassurance scan Glasgow. Viability scan Glasgow, specialist scan Glasgow, private baby scan Glasgow, early pregnancy ultrasound Glasgow, private pregnancy scan Glasgow, internal scan Glasgow, previous ectopic scan Glasgow, previous miscarriage scan Glasgow, pregnancy symptoms scan Glasgow, 6 week scan Glasgow, 7 week scan Glasgow, 8 week scan Glasgow, 9 week scan Glasgow, 10 week scan Glasgow, 11 week scan Glasgow, 12 week scan Glasgow, Early baby scan Anderston, early scan Anderston, early pregnancy scan Anderston, dating scan Anderston, reassurance scan Anderston. Viability scan Anderston, specialist scan Anderston, private baby scan Anderston, early pregnancy ultrasound Anderston, private pregnancy scan Anderston, internal scan Anderston, previous ectopic scan Anderston, previous miscarriage scan Anderston, pregnancy symptoms scan Anderston, 6 week scan Anderston, 7 week scan Anderston, 8 week scan Anderston, 9 week scan Anderston, 10 week scan Anderston, 11 week scan Anderston, 12 week scan Anderston, Early baby scan Anniesland, early scan Anniesland, early pregnancy scan Anniesland, dating scan Anniesland, reassurance scan Anniesland. Viability scan Anniesland, specialist scan Anniesland, private baby scan Anniesland, early pregnancy ultrasound Anniesland, private pregnancy scan Anniesland, internal scan Anniesland, previous ectopic scan Anniesland, previous miscarriage scan Anniesland, pregnancy symptoms scan Anniesland, 6 week scan Anniesland, 7 week scan Anniesland, 8 week scan Anniesland, 9 week scan Anniesland, 10 week scan Anniesland, 11 week scan Anniesland, 12 week scan Anniesland,Early baby scan Auchenshuggle, early scan Auchenshuggle, early pregnancy scan Auchenshuggle, dating scan Auchenshuggle, reassurance scan Auchenshuggle. Viability scan Auchenshuggle, specialist scan Auchenshuggle, private baby scan Auchenshuggle, early pregnancy ultrasound Auchenshuggle, private pregnancy scan Auchenshuggle, internal scan Auchenshuggle, previous ectopic scan Auchenshuggle, previous miscarriage scan Auchenshuggle, pregnancy symptoms scan Auchenshuggle, 6 week scan Auchenshuggle, 7 week scan Auchenshuggle, 8 week scan Auchenshuggle, 9 week scan Auchenshuggle, 10 week scan Auchenshuggle, 11 week scan Auchenshuggle, 12 week scan Auchenshuggle, Early baby scan Baillieston, early scan Baillieston, early pregnancy scan Baillieston, dating scan Baillieston, reassurance scan Baillieston. Viability scan Baillieston, specialist scan Baillieston, private baby scan Baillieston, early pregnancy ultrasound Baillieston, private pregnancy scan Baillieston, internal scan Baillieston, previous ectopic scan Baillieston, previous miscarriage scan Baillieston, pregnancy symptoms scan Baillieston, 6 week scan Baillieston, 7 week scan Baillieston, 8 week scan Baillieston, 9 week scan Baillieston, 10 week scan Baillieston, 11 week scan Baillieston, 12 week scan Baillieston, Early baby scan Balornock, early scan Balornock, early pregnancy scan Balornock, dating scan Balornock, reassurance scan Balornock. Viability scan Balornock, specialist scan Balornock, private baby scan Balornock, early pregnancy ultrasound Balornock, private pregnancy scan Balornock, internal scan Balornock, previous ectopic scan Balornock, previous miscarriage scan Balornock, pregnancy symptoms scan Balornock, 6 week scan Balornock, 7 week scan Balornock, 8 week scan Balornock, 9 week scan Balornock, 10 week scan Balornock, 11 week scan Balornock, 12 week scan Balornock, Early baby scan Garnethill, early scan Garnethill, early pregnancy scan Garnethill, dating scan Garnethill, reassurance scan Garnethill. Viability scan Garnethill, specialist scan Garnethill, private baby scan Garnethill, early pregnancy ultrasound Garnethill, private pregnancy scan Garnethill, internal scan Garnethill, previous ectopic scan Garnethill, previous miscarriage scan Garnethill, pregnancy symptoms scan Garnethill, 6 week scan Garnethill, 7 week scan Garnethill, 8 week scan Garnethill, 9 week scan Garnethill, 10 week scan Garnethill, 11 week scan Garnethill, 12 week scan Garnethill, Early baby scan Germiston, early scan Germiston, early pregnancy scan Germiston, dating scan Germiston, reassurance scan Germiston. Viability scan Germiston, specialist scan Germiston, private baby scan Germiston, early pregnancy ultrasound Germiston, private pregnancy scan Germiston, internal scan Germiston, previous ectopic scan Germiston, previous miscarriage scan Germiston, pregnancy symptoms scan Germiston, 6 week scan Germiston, 7 week scan Germiston, 8 week scan Germiston, 9 week scan Germiston, 10 week scan Germiston, 11 week scan Germiston, 12 week scan Germiston, Early baby scan Hamiltonhill, early scan Hamiltonhill, early pregnancy scan Hamiltonhill, dating scan Hamiltonhill, reassurance scan Hamiltonhill. Viability scan Hamiltonhill, specialist scan Hamiltonhill, private baby scan Hamiltonhill, early pregnancy ultrasound Hamiltonhill, private pregnancy scan Hamiltonhill, internal scan Hamiltonhill, previous ectopic scan Hamiltonhill, previous miscarriage scan Hamiltonhill, pregnancy symptoms scan Hamiltonhill, 6 week scan Hamiltonhill, 7 week scan Hamiltonhill, 8 week scan Hamiltonhill, 9 week scan Hamiltonhill, 10 week scan Hamiltonhill, 11 week scan Hamiltonhill, 12 week scan Hamiltonhill, Early baby scan Jordanhill, early scan Jordanhill, early pregnancy scan Jordanhill, dating scan Jordanhill, reassurance scan Jordanhill. Viability scan Jordanhill, specialist scan Jordanhill, private baby scan Jordanhill, early pregnancy ultrasound Jordanhill, private pregnancy scan Jordanhill, internal scan Jordanhill, previous ectopic scan Jordanhill, previous miscarriage scan Jordanhill, pregnancy symptoms scan Jordanhill, 6 week scan Jordanhill, 7 week scan Jordanhill, 8 week scan Jordanhill, 9 week scan Jordanhill, 10 week scan Jordanhill, 11 week scan Jordanhill, 12 week scan Jordanhill, Early baby scan East Kilbride, early scan East Kilbride, early pregnancy scan East Kilbride, dating scan East Kilbride, reassurance scan East Kilbride. Viability scan East Kilbride, specialist scan East Kilbride, private baby scan East Kilbride, early pregnancy ultrasound East Kilbride, private pregnancy scan East Kilbride, internal scan East Kilbride, previous ectopic scan East Kilbride, previous miscarriage scan East Kilbride, pregnancy symptoms scan East Kilbride, 6 week scan East Kilbride, 7 week scan East Kilbride, 8 week scan East Kilbride, 9 week scan East Kilbride, 10 week scan East Kilbride, 11 week scan East Kilbride, 12 week scan East Kilbride, Early baby scan Rutherglen, early scan Rutherglen, early pregnancy scan Rutherglen, dating scan Rutherglen, reassurance scan Rutherglen. Viability scan Rutherglen, specialist scan Rutherglen, private baby scan Rutherglen, early pregnancy ultrasound Rutherglen, private pregnancy scan Rutherglen, internal scan Rutherglen, previous ectopic scan Rutherglen, previous miscarriage scan Rutherglen, pregnancy symptoms scan Rutherglen, 6 week scan Rutherglen, 7 week scan Rutherglen, 8 week scan Rutherglen, 9 week scan Rutherglen, 10 week scan Rutherglen, 11 week scan Rutherglen, 12 week scan Rutherglen, Early baby scan Lanark, early scan Lanark, early pregnancy scan Lanark, dating scan Lanark, reassurance scan Lanark. Viability scan Lanark, specialist scan Lanark, private baby scan Lanark, early pregnancy ultrasound Lanark, private pregnancy scan Lanark, internal scan Lanark, previous ectopic scan Lanark, previous miscarriage scan Lanark, pregnancy symptoms scan Lanark, 6 week scan Lanark, 7 week scan Lanark, 8 week scan Lanark, 9 week scan Lanark, 10 week scan Lanark, 11 week scan Lanark, 12 week scan Lanark, Early baby scan Bothwell, early scan Bothwell, early pregnancy scan Bothwell, dating scan Bothwell, reassurance scan Bothwell. Viability scan Bothwell, specialist scan Bothwell, private baby scan Bothwell, early pregnancy ultrasound Bothwell, private pregnancy scan Bothwell, internal scan Bothwell, previous ectopic scan Bothwell, previous miscarriage scan Bothwell, pregnancy symptoms scan Bothwell, 6 week scan Bothwell, 7 week scan Bothwell, 8 week scan Bothwell, 9 week scan Bothwell, 10 week scan Bothwell, 11 week scan Bothwell, 12 week scan Bothwell, Early baby scan Maryhill, early scan Maryhill, early pregnancy scan Maryhill, dating scan Maryhill, reassurance scan Maryhill. Viability scan Maryhill, specialist scan Maryhill, private baby scan Maryhill, early pregnancy ultrasound Maryhill, private pregnancy scan Maryhill, internal scan Maryhill, previous ectopic scan Maryhill, previous miscarriage scan Maryhill, pregnancy symptoms scan Maryhill, 6 week scan Maryhill, 7 week scan Maryhill, 8 week scan Maryhill, 9 week scan Maryhill, 10 week scan Maryhill, 11 week scan Maryhill, 12 week scan Maryhill, Early baby scan Camlachie, early scan Camlachie, early pregnancy scan Camlachie, dating scan Camlachie, reassurance scan Camlachie. Viability scan Camlachie, specialist scan Camlachie, private baby scan Camlachie, early pregnancy ultrasound Camlachie, private pregnancy scan Camlachie, internal scan Camlachie, previous ectopic scan Camlachie, previous miscarriage scan Camlachie, pregnancy symptoms scan Camlachie, 6 week scan Camlachie, 7 week scan Camlachie, 8 week scan Camlachie, 9 week scan Camlachie, 10 week scan Camlachie, 11 week scan Camlachie, 12 week scan Camlachie, Early baby scan Haghill, early scan Haghill, early pregnancy scan Haghill, dating scan Haghill, reassurance scan Haghill. Viability scan Haghill, specialist scan Haghill, private baby scan Haghill, early pregnancy ultrasound Haghill, private pregnancy scan Haghill, internal scan Haghill, previous ectopic scan Haghill, previous miscarriage scan Haghill, pregnancy symptoms scan Haghill, 6 week scan Haghill, 7 week scan Haghill, 8 week scan Haghill, 9 week scan Haghill, 10 week scan Haghill, 11 week scan Haghill, 12 week scan Haghill, Early baby scan Kelvindale, early scan Kelvindale, early pregnancy scan Kelvindale, dating scan Kelvindale, reassurance scan Kelvindale. Viability scan Kelvindale, specialist scan Kelvindale, private baby scan Kelvindale, early pregnancy ultrasound Kelvindale, private pregnancy scan Kelvindale, internal scan Kelvindale, previous ectopic scan Kelvindale, previous miscarriage scan Kelvindale, pregnancy symptoms scan Kelvindale, 6 week scan Kelvindale, 7 week scan Kelvindale, 8 week scan Kelvindale, 9 week scan Kelvindale, 10 week scan Kelvindale, 11 week scan Kelvindale, 12 week scan Kelvindale, Early baby scan Knightswood, early scan Knightswood, early pregnancy scan Knightswood, dating scan Knightswood, reassurance scan Knightswood. Viability scan Knightswood, specialist scan Knightswood, private baby scan Knightswood, early pregnancy ultrasound Knightswood, private pregnancy scan Knightswood, internal scan Knightswood, previous ectopic scan Knightswood, previous miscarriage scan Knightswood, pregnancy symptoms scan Knightswood, 6 week scan Knightswood, 7 week scan Knightswood, 8 week scan Knightswood, 9 week scan Knightswood, 10 week scan Knightswood, 11 week scan Knightswood, 12 week scan Knightswood.